4 – 1 Copyright © 2010 Pearson Education, Inc. Publishing as Prentice Hall. 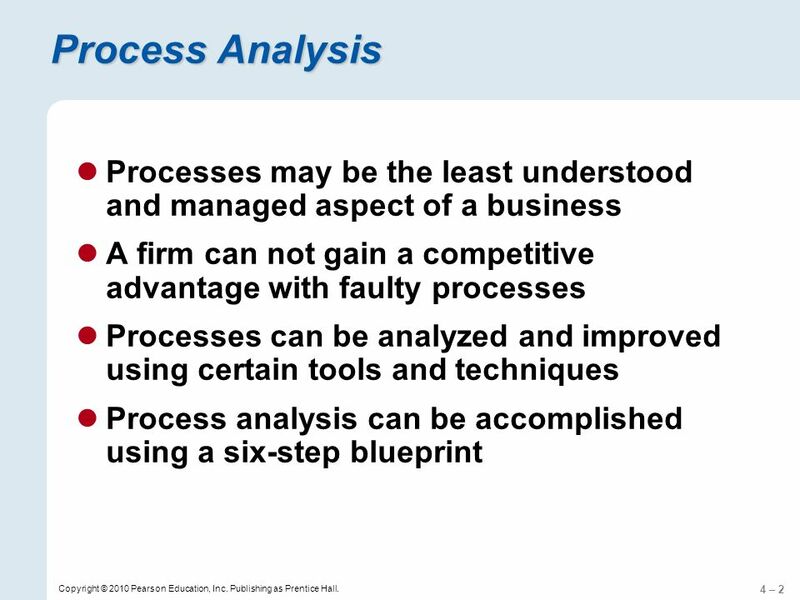 Process Analysis 4 For Operations Management, 9e by Krajewski/Ritzman/Malhotra. 14 4 – 14 Copyright © 2010 Pearson Education, Inc. Publishing as Prentice Hall. 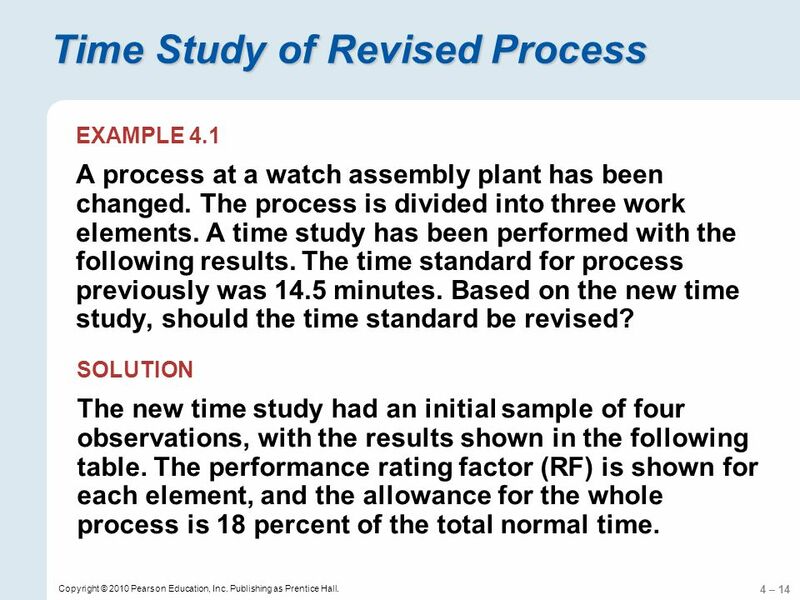 Time Study of Revised Process EXAMPLE 4.1 A process at a watch assembly plant has been changed. 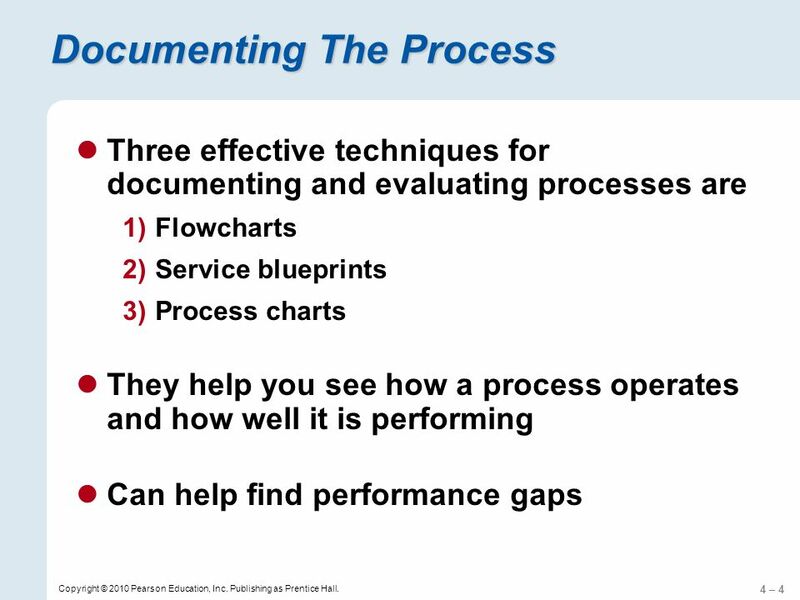 The process is divided into three work elements. A time study has been performed with the following results. 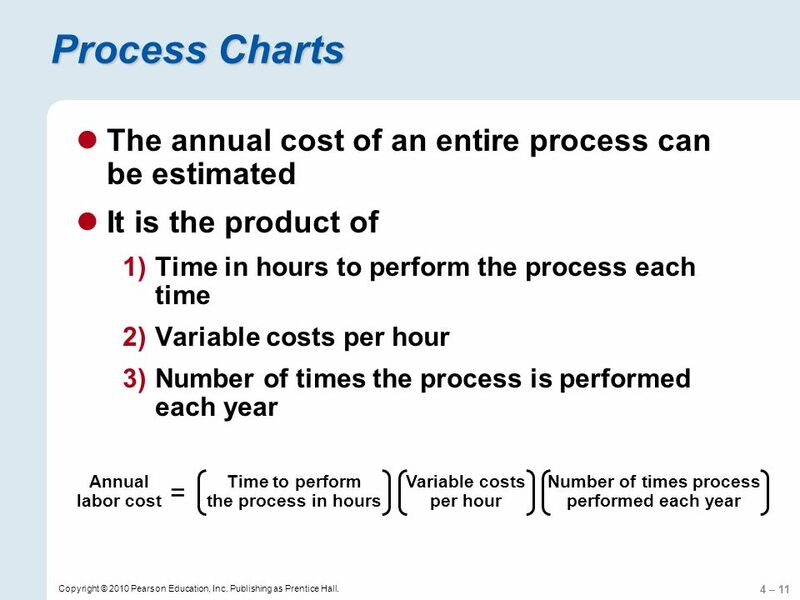 The time standard for process previously was 14.5 minutes. 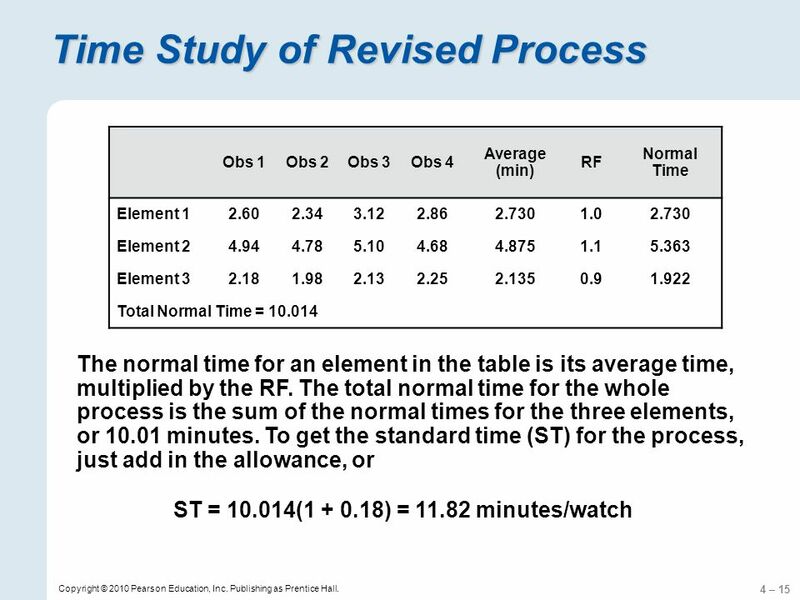 Based on the new time study, should the time standard be revised? 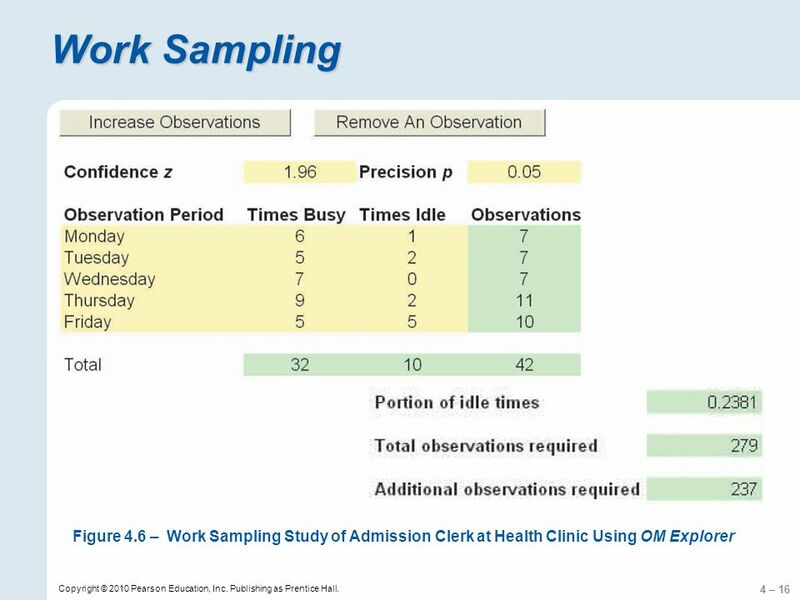 SOLUTION The new time study had an initial sample of four observations, with the results shown in the following table. 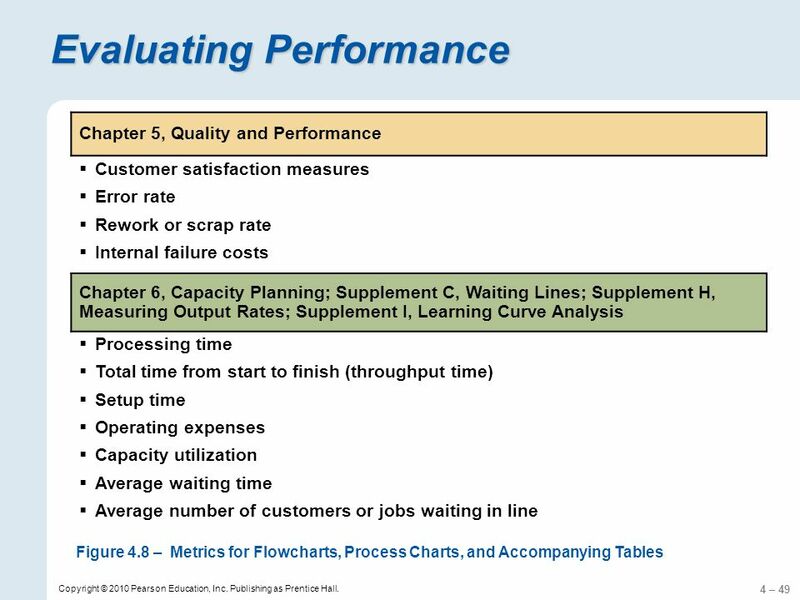 The performance rating factor (RF) is shown for each element, and the allowance for the whole process is 18 percent of the total normal time. 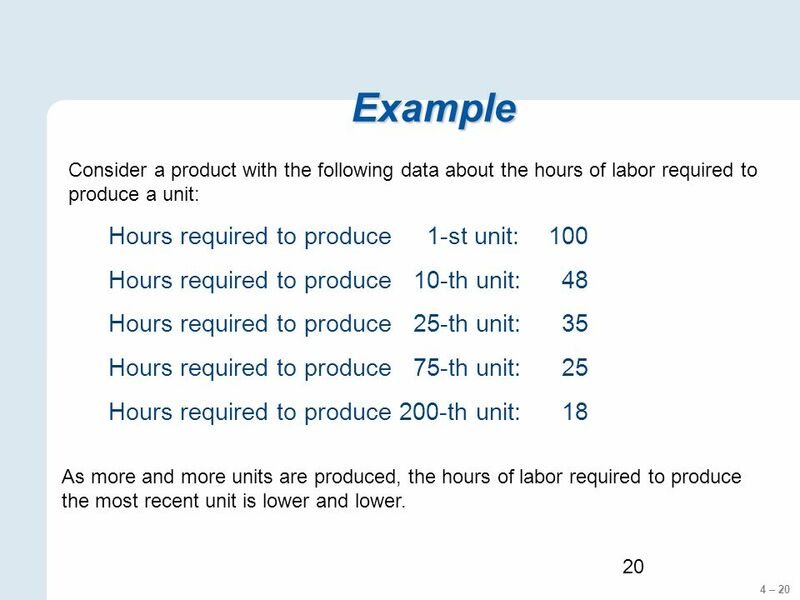 20 4 – 20 20 Example Consider a product with the following data about the hours of labor required to produce a unit: Hours required to produce 1-st unit:100 Hours required to produce 10-th unit: 48 Hours required to produce 25-th unit: 35 Hours required to produce 75-th unit: 25 Hours required to produce 200-th unit: 18 As more and more units are produced, the hours of labor required to produce the most recent unit is lower and lower. 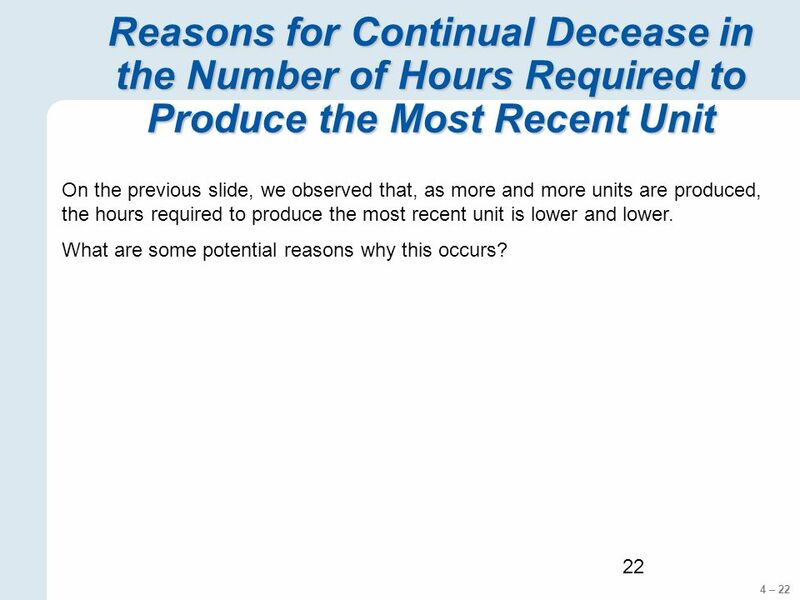 22 4 – 22 22 Reasons for Continual Decease in the Number of Hours Required to Produce the Most Recent Unit On the previous slide, we observed that, as more and more units are produced, the hours required to produce the most recent unit is lower and lower. What are some potential reasons why this occurs? 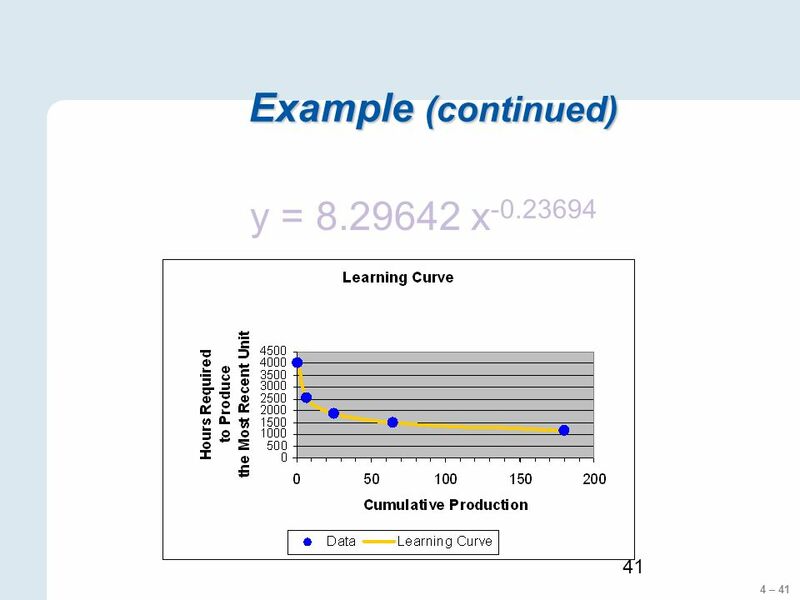 23 4 – 23 23 What happens when cumulative production doubles? 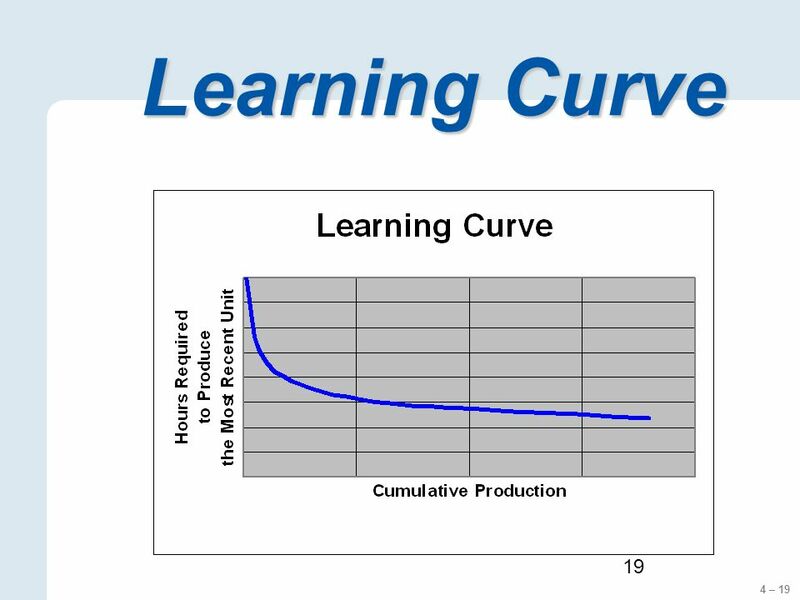 The concept of a Learning Curve is motivated by the observation (in many diverse production environments) that, each time the cumulative production doubles, the hours required to produce the most recent unit decreases by approximately the same percentage. 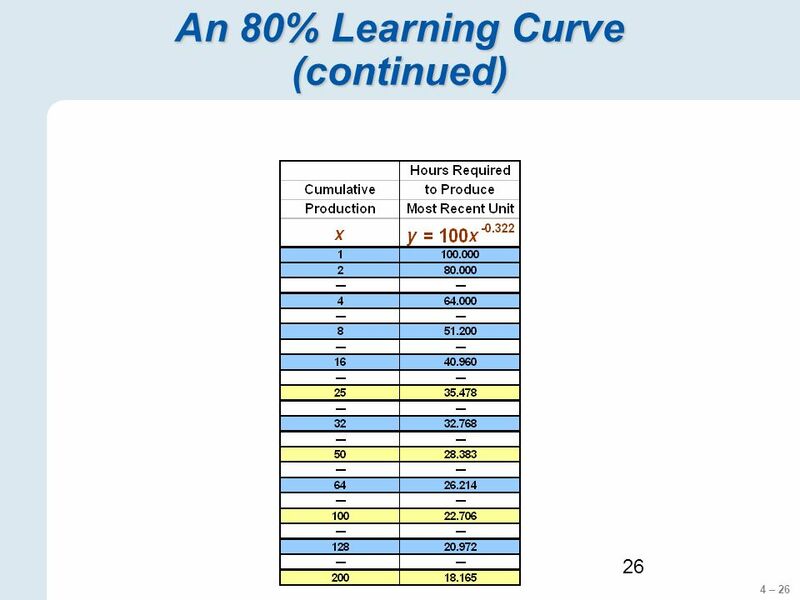 For example, for an 80% learning curve, If cumulative production doubles from 50 to 100, then the hours required to produce the 100-th unit is 80% of that for the 50-th unit. 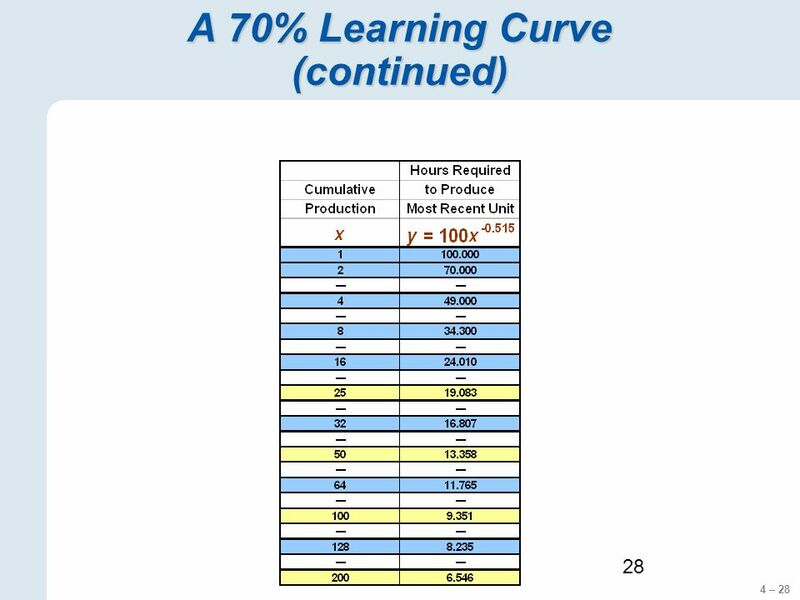 If cumulative production doubles from 100 to 200, then the hours required to produce the 200-th unit is 80% of that for the 100-th unit. 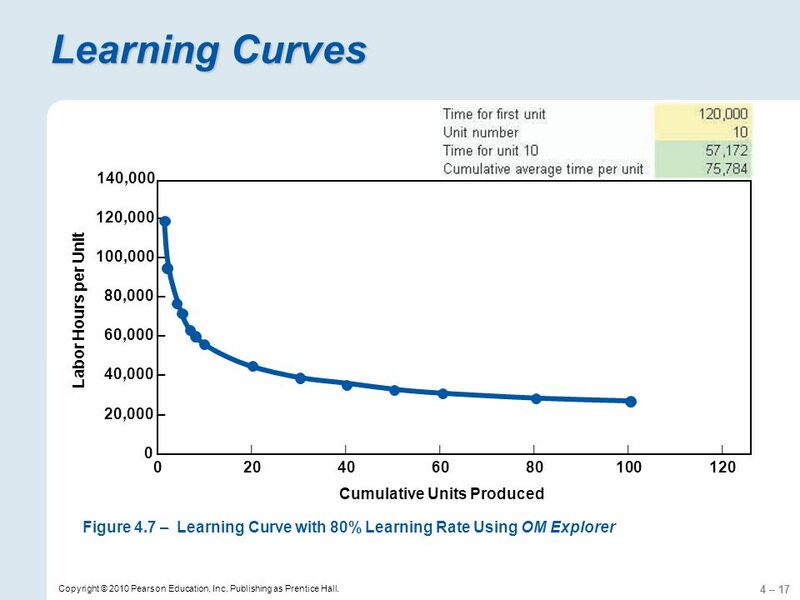 31 4 – 31 31 Operational Application of the Leaning Curve Assume that production of the 1-st unit required 100 hours, and assume that there is an 80% learning curve. Then, y = 100x -0.322. 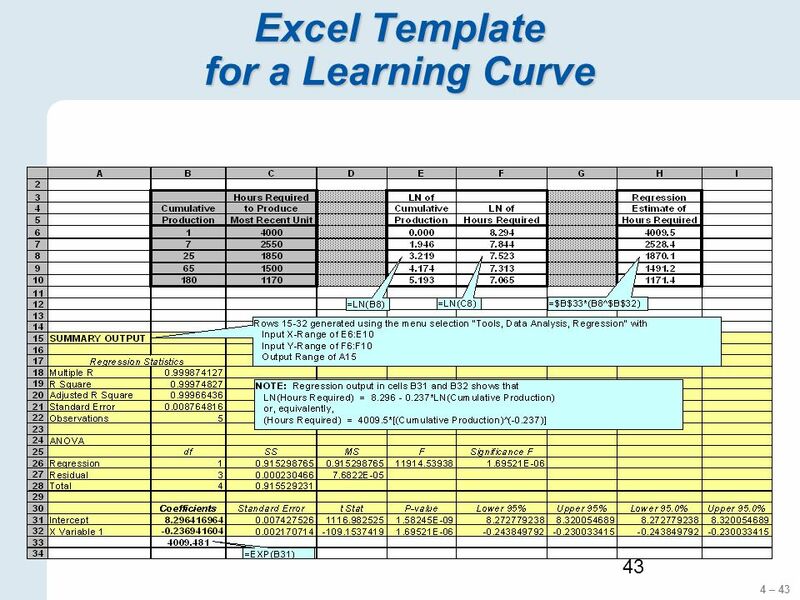 Also, assume that cumulative production to date is 150 units. 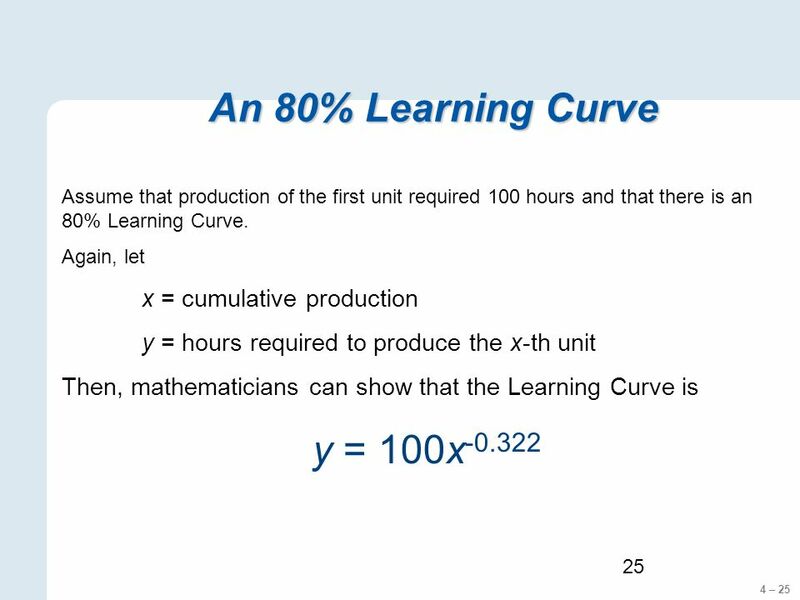 The learning curve can be used to provide estimates of answers to questions about the production of the next 100 units. 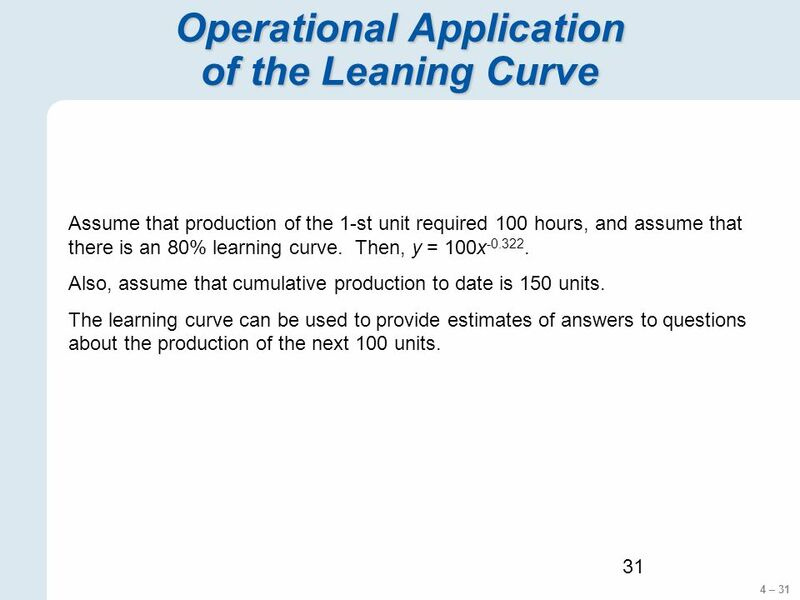 32 4 – 32 32 Operational Application of a Leaning Curve (continued) Question 1: To produce the next 100 units, how many hours of labor will be required? 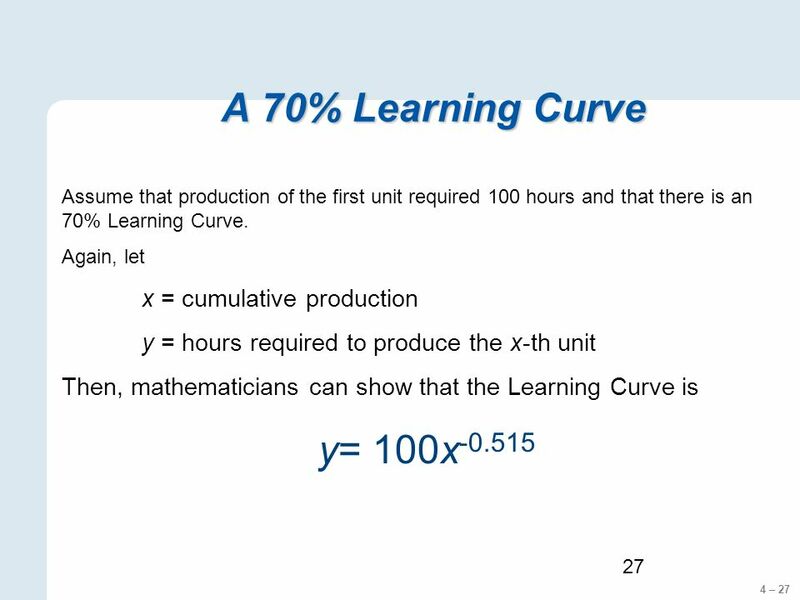 Question 2: With a labor force of 6 workers each working 40 hours per week, how long will it take to produce then next 100 units? 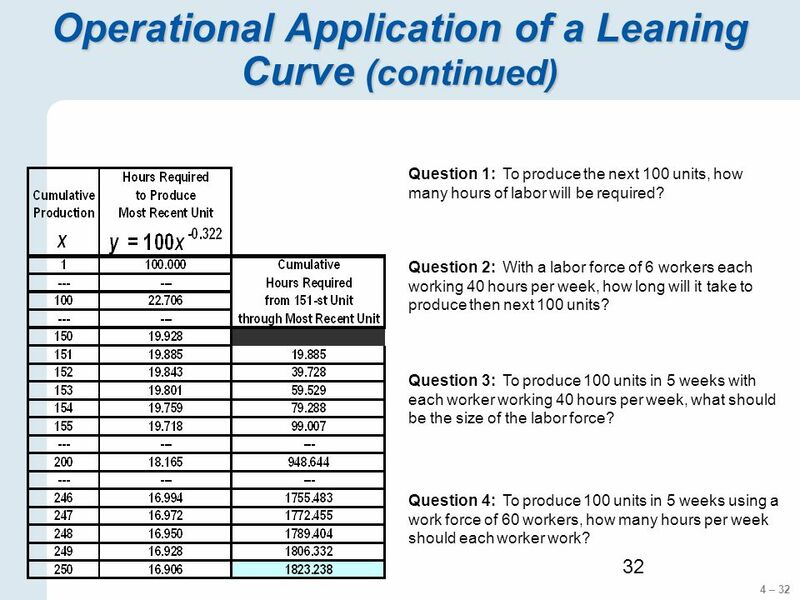 Question 3: To produce 100 units in 5 weeks with each worker working 40 hours per week, what should be the size of the labor force? 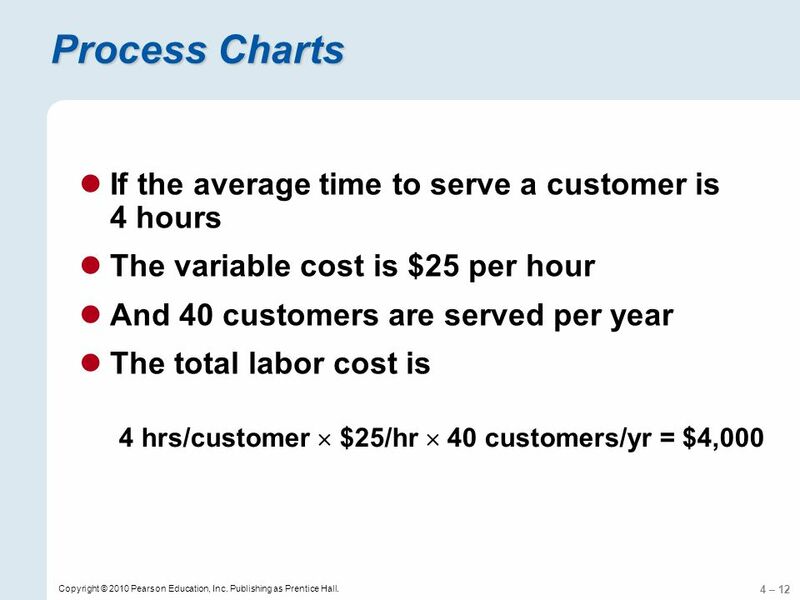 Question 4: To produce 100 units in 5 weeks using a work force of 60 workers, how many hours per week should each worker work? 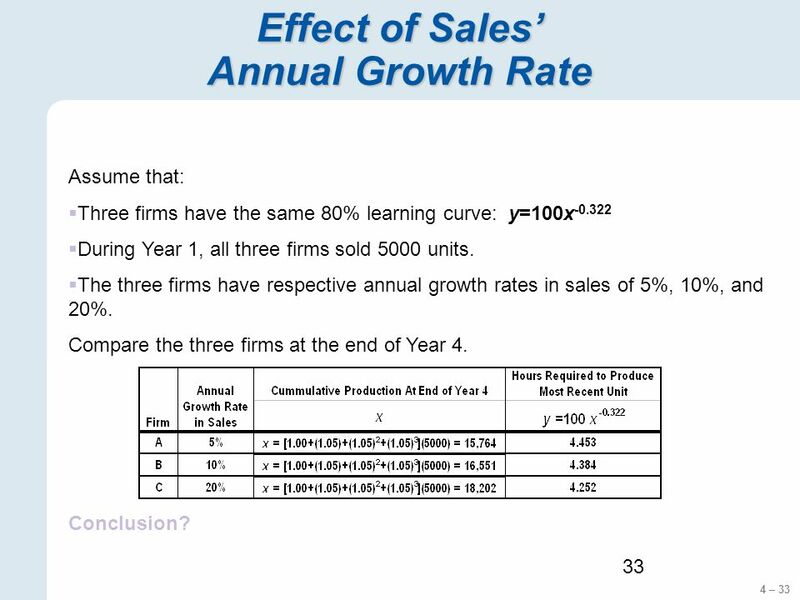 33 4 – 33 33 Effect of Sales Annual Growth Rate Assume that: Three firms have the same 80% learning curve: y=100x -0.322 During Year 1, all three firms sold 5000 units. 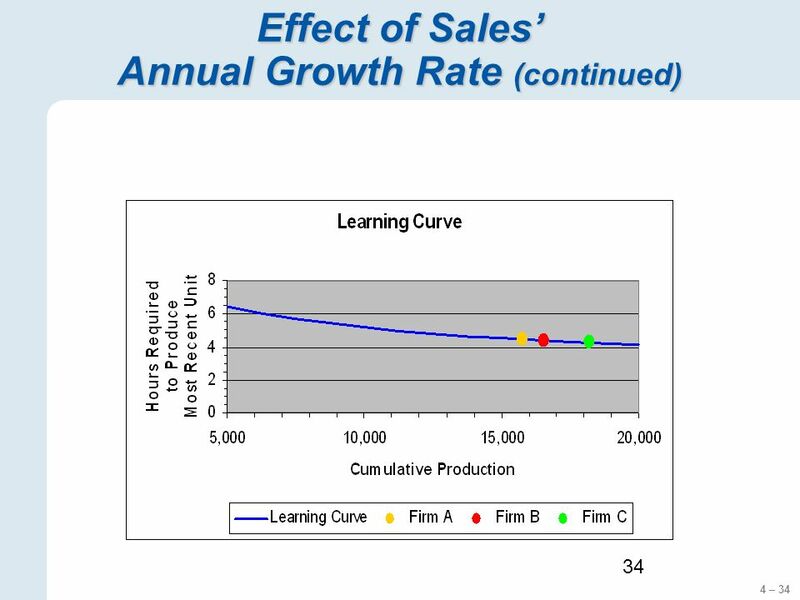 The three firms have respective annual growth rates in sales of 5%, 10%, and 20%. 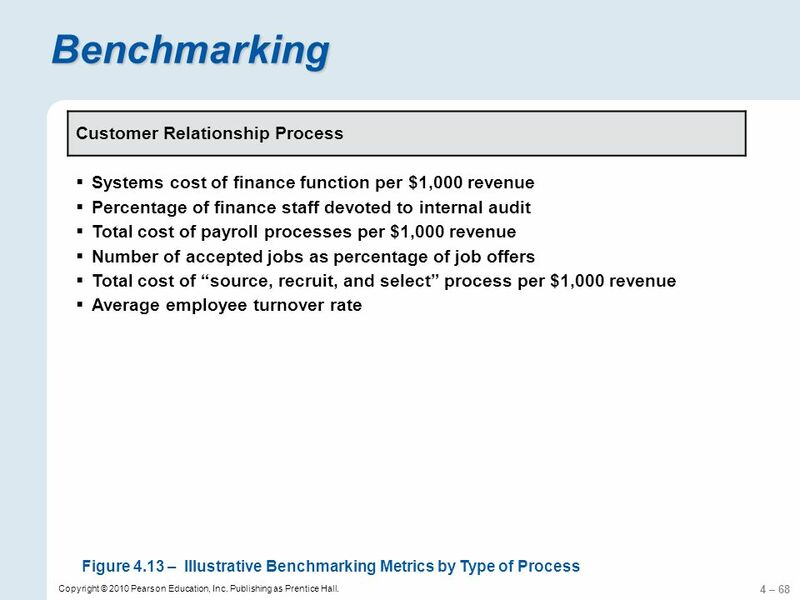 Compare the three firms at the end of Year 4. Conclusion? 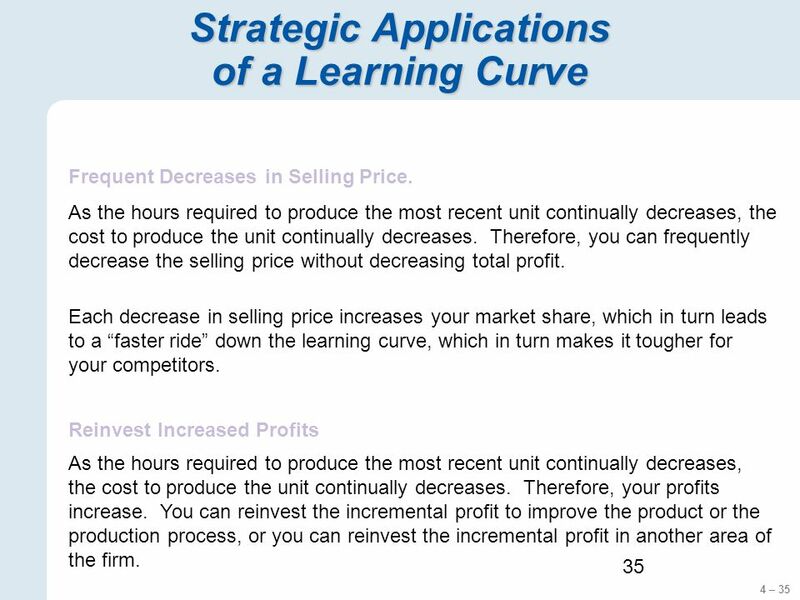 35 4 – 35 35 Strategic Applications of a Learning Curve Frequent Decreases in Selling Price. Each decrease in selling price increases your market share, which in turn leads to a faster ride down the learning curve, which in turn makes it tougher for your competitors. 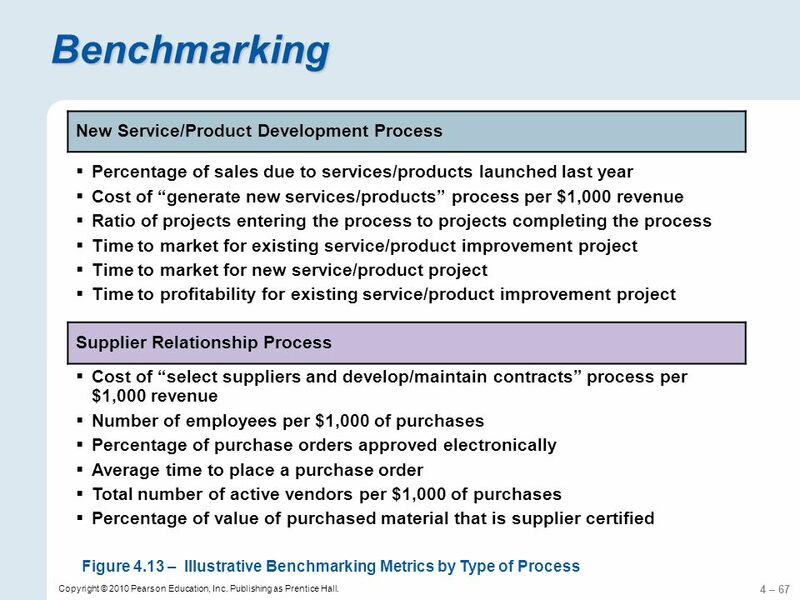 Reinvest Increased Profits As the hours required to produce the most recent unit continually decreases, the cost to produce the unit continually decreases. Therefore, your profits increase. 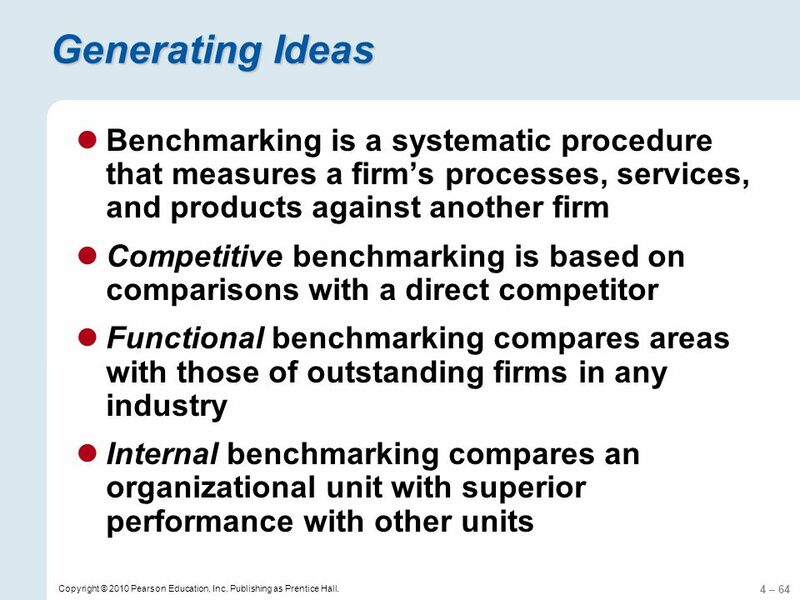 You can reinvest the incremental profit to improve the product or the production process, or you can reinvest the incremental profit in another area of the firm. 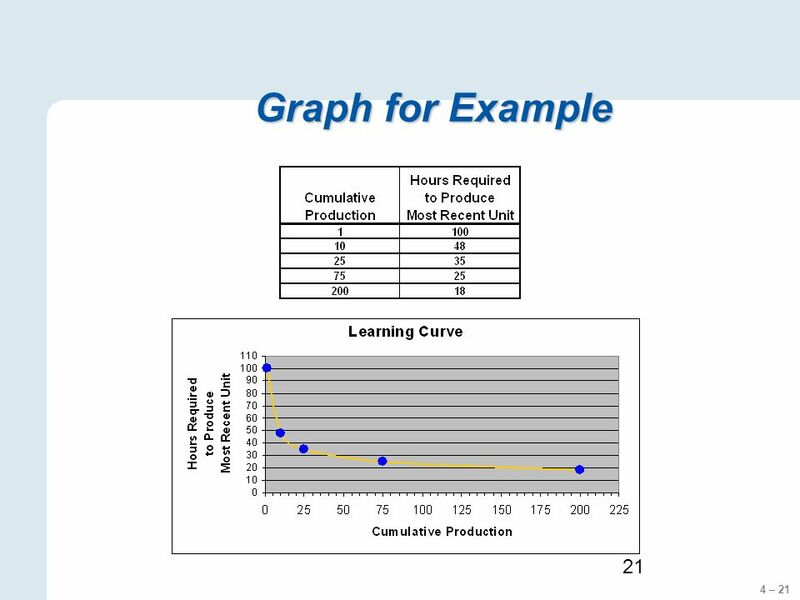 As the hours required to produce the most recent unit continually decreases, the cost to produce the unit continually decreases. 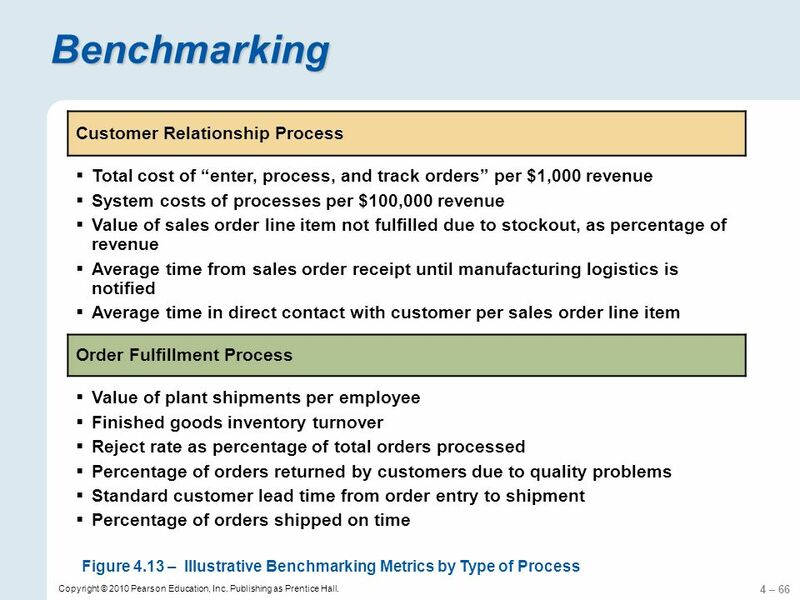 Therefore, you can frequently decrease the selling price without decreasing total profit. 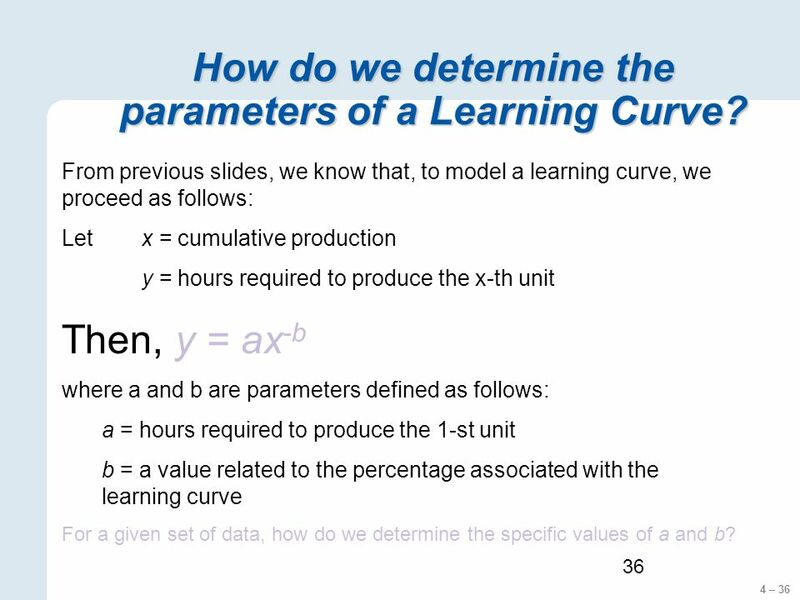 36 4 – 36 36 How do we determine the parameters of a Learning Curve? 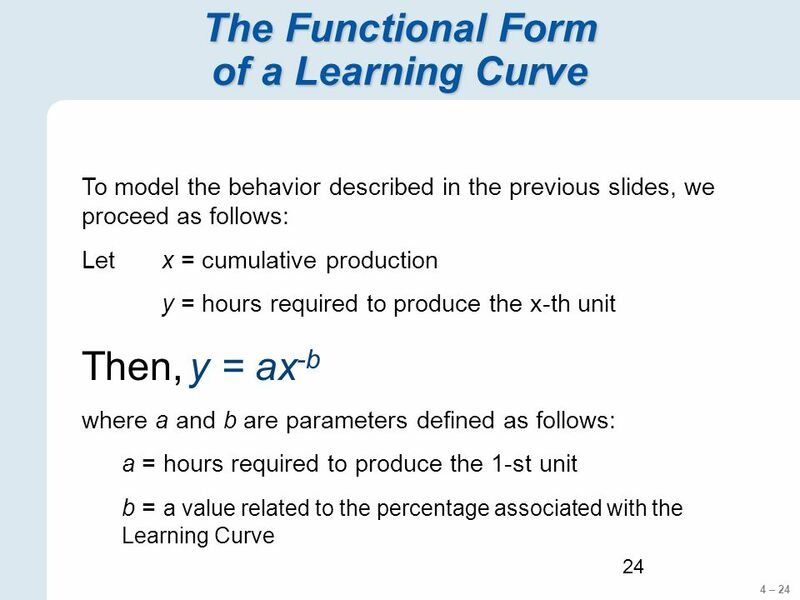 From previous slides, we know that, to model a learning curve, we proceed as follows: Letx = cumulative production y = hours required to produce the x-th unit Then, y = ax -b where a and b are parameters defined as follows: a = hours required to produce the 1-st unit b = a value related to the percentage associated with the learning curve For a given set of data, how do we determine the specific values of a and b? 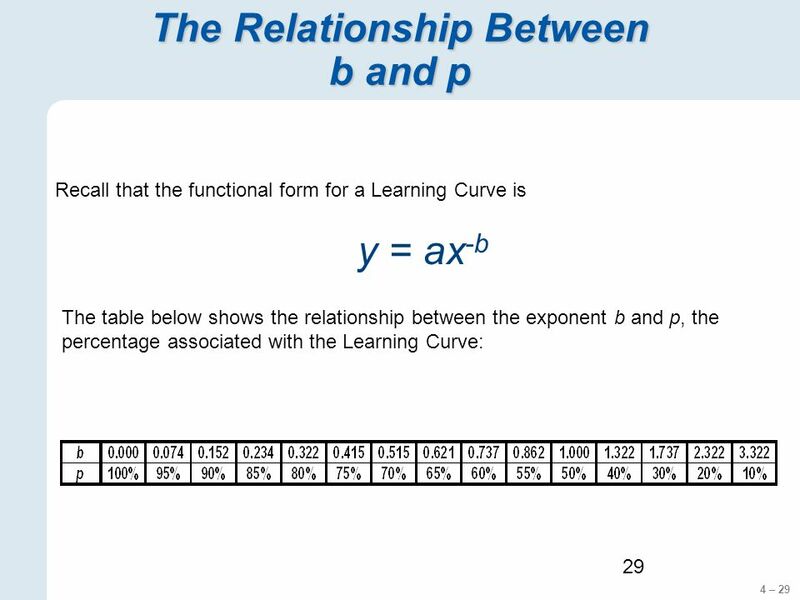 37 4 – 37 37 Example For the Learning curve y=ax -b, how do we determine the specific values of a and b? 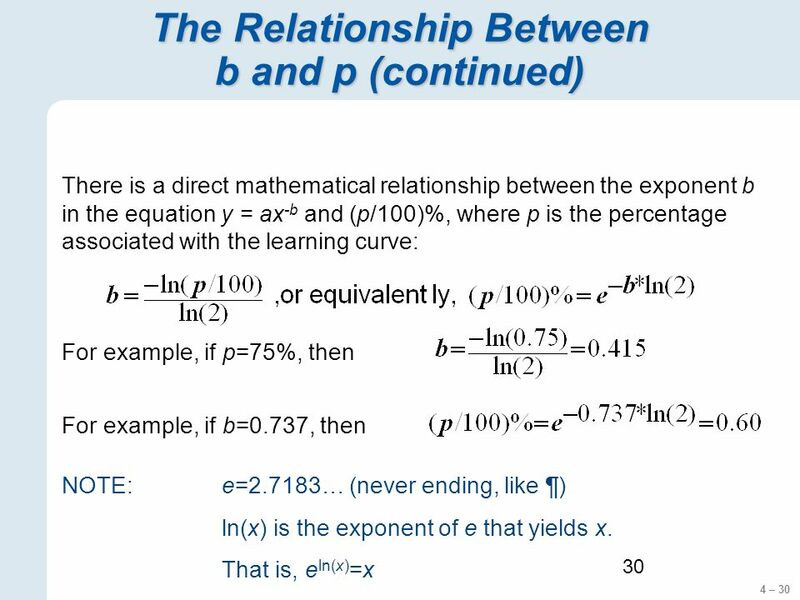 We begin by taking the natural logs of both sides of y=ax -b. 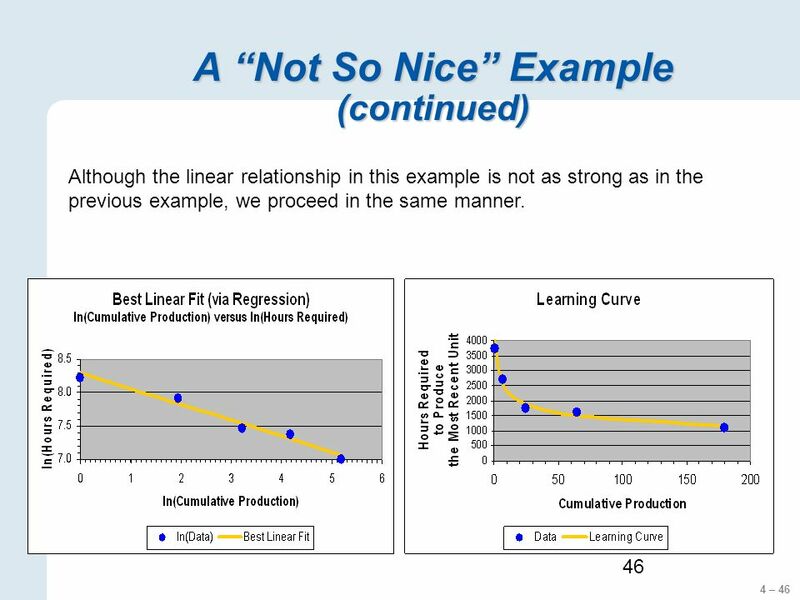 Note the linear relationship between ln(x) and ln(y). 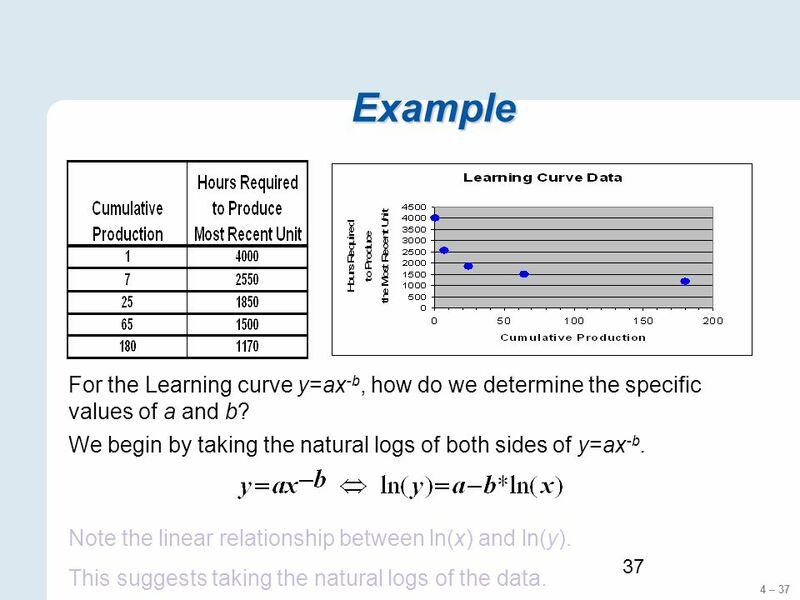 This suggests taking the natural logs of the data. 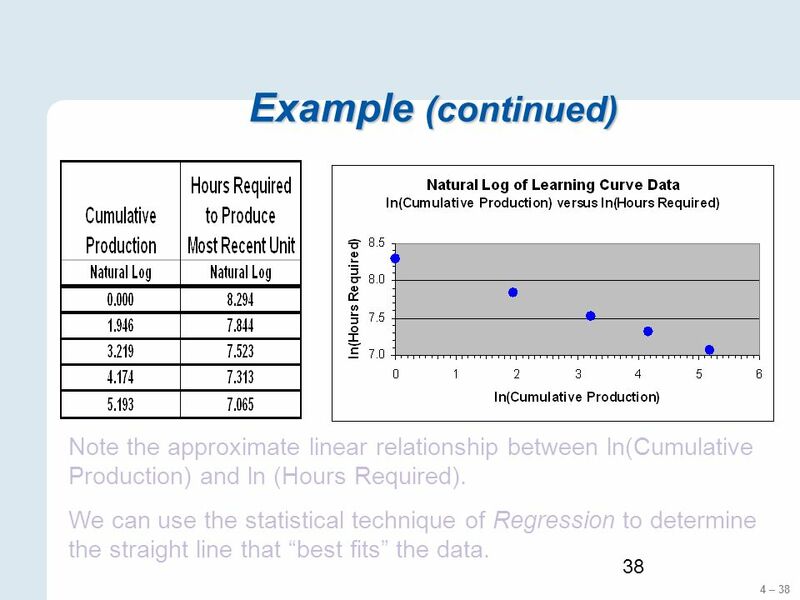 38 4 – 38 38 Example (continued) Note the approximate linear relationship between ln(Cumulative Production) and ln (Hours Required). 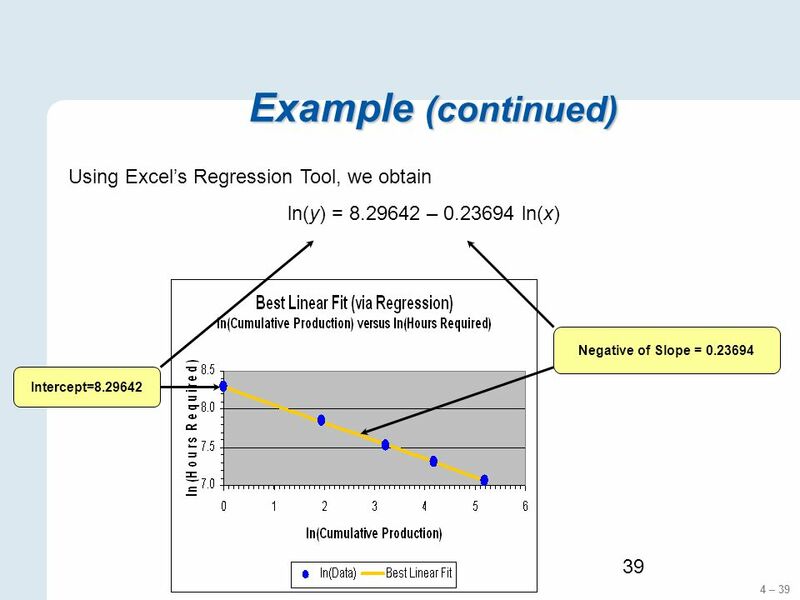 We can use the statistical technique of Regression to determine the straight line that best fits the data. 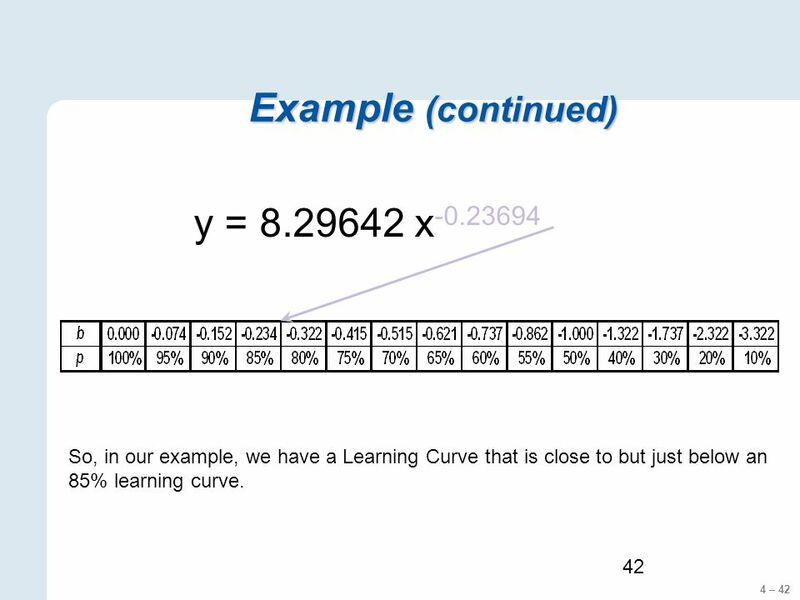 42 4 – 42 42 Example (continued) y = 8.29642 x -0.23694 So, in our example, we have a Learning Curve that is close to but just below an 85% learning curve. 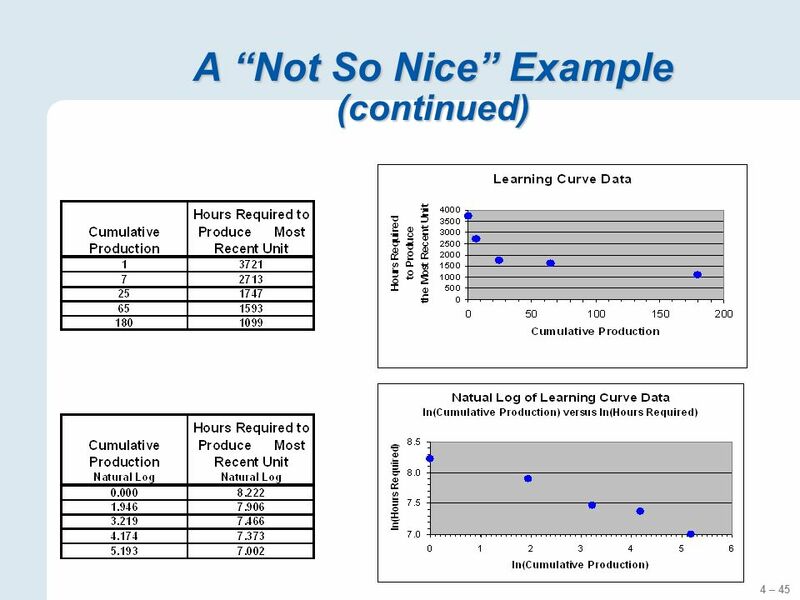 44 4 – 44 44 A Not So Nice Example In our example, there was a very close linear relationship between ln(Cumulative Production) and ln(Hours Required) This is NOT the typical situation. 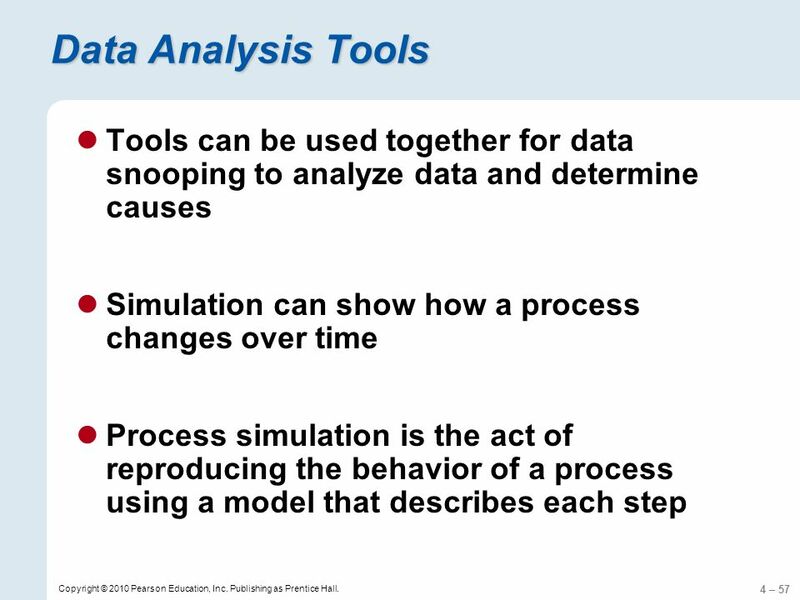 A more typical situation is shown on the next slide. 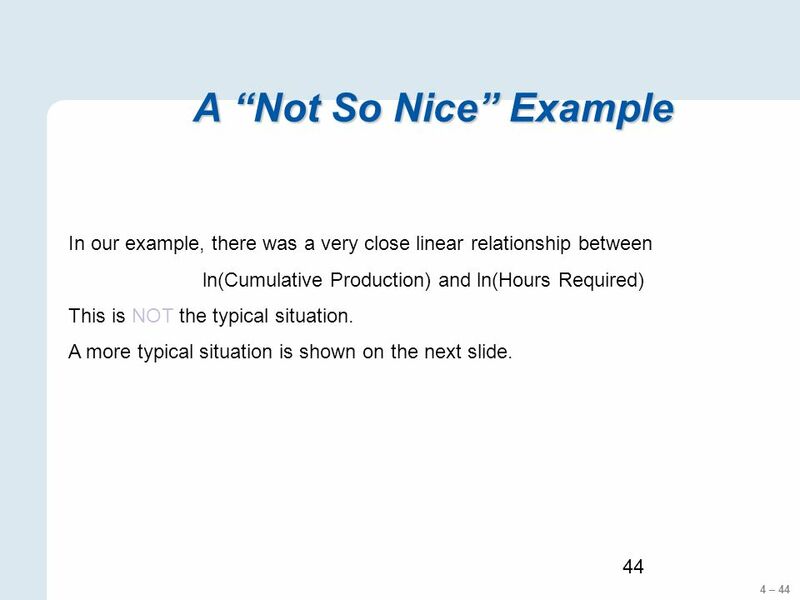 46 4 – 46 46 A Not So Nice Example (continued) Although the linear relationship in this example is not as strong as in the previous example, we proceed in the same manner. 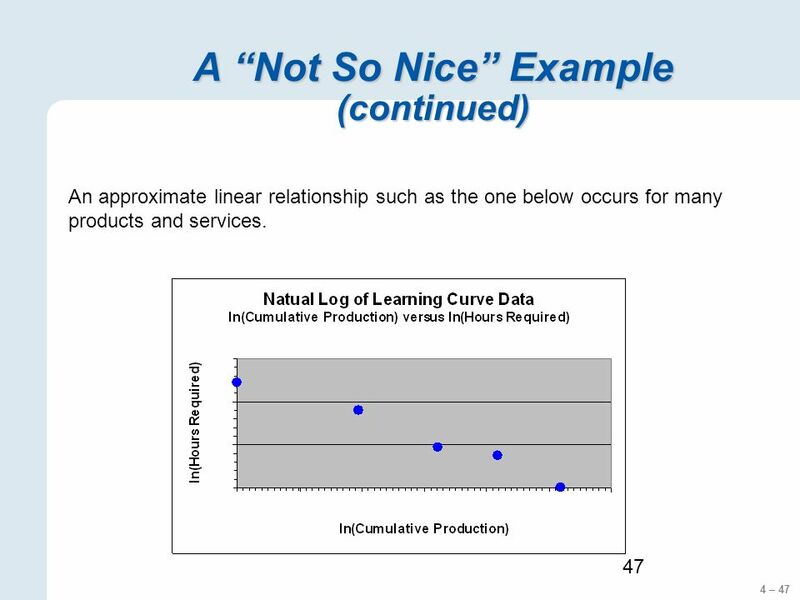 47 4 – 47 47 A Not So Nice Example (continued) An approximate linear relationship such as the one below occurs for many products and services. 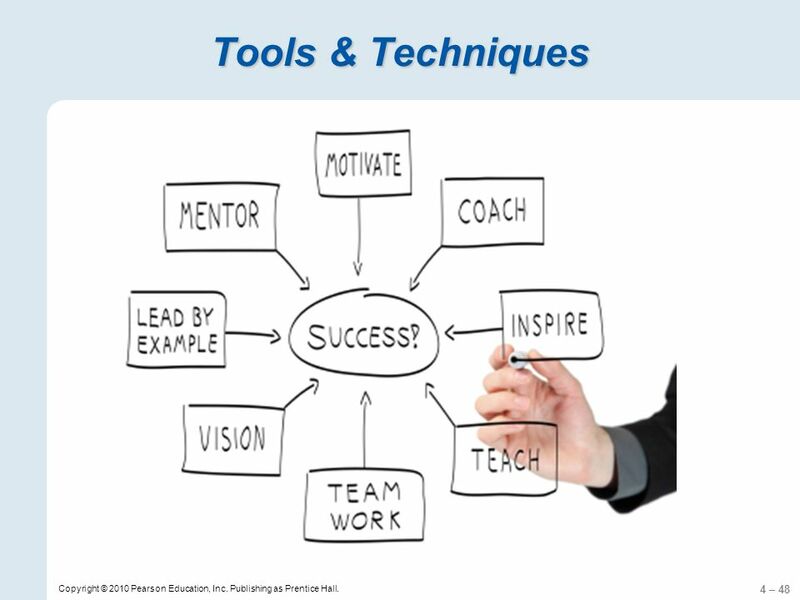 48 4 – 48 Tools & Techniques Copyright © 2010 Pearson Education, Inc. Publishing as Prentice Hall. 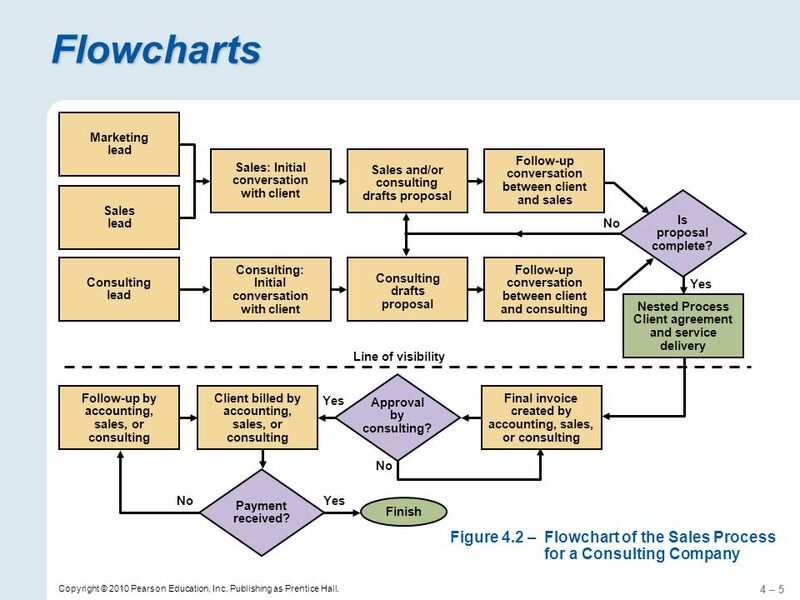 53 4 – 53 Copyright © 2010 Pearson Education, Inc. Publishing as Prentice Hall. 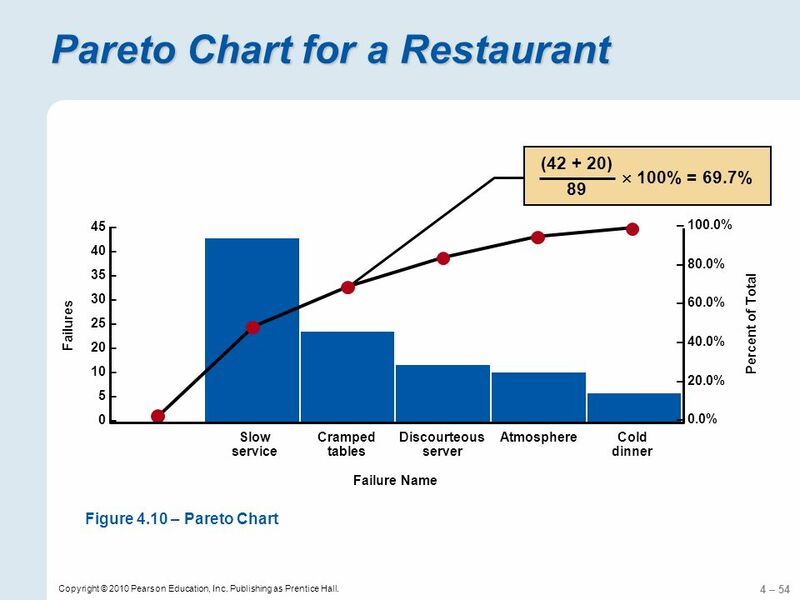 Pareto Chart for a Restaurant 50 – 45 – 40 – 35 – 30 – 25 – 20 – 10 – 5 – 0 – Failures Discourteous server Slow service Cold dinner Cramped tables Atmosphere Failure Name Figure 4.9 –Bar Chart Figure 4.9 is a bar chart and Figure 4.10 is a Pareto chart, both created with OM Explorers Bar, Pareto, and Line Charts solver. 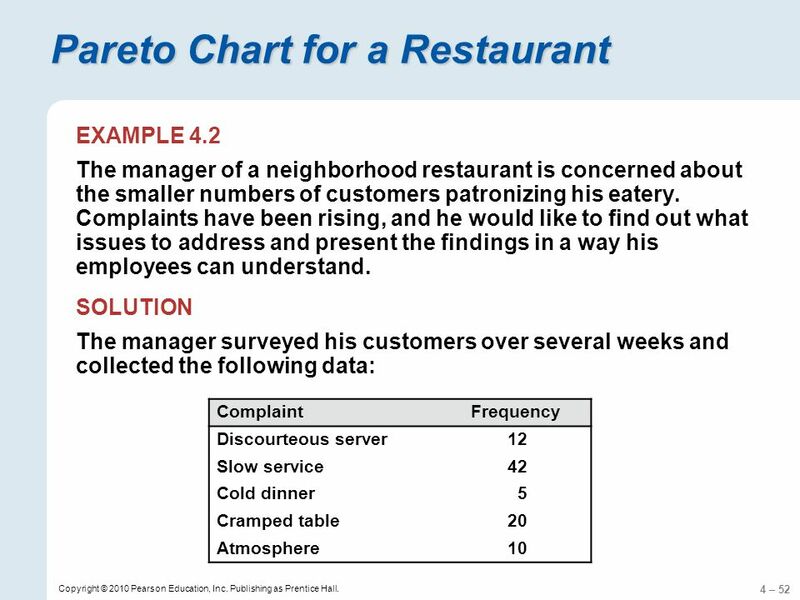 They present the data in a way that shows which complaints are more prevalent (the vital few). 55 4 – 55 Copyright © 2010 Pearson Education, Inc. Publishing as Prentice Hall. 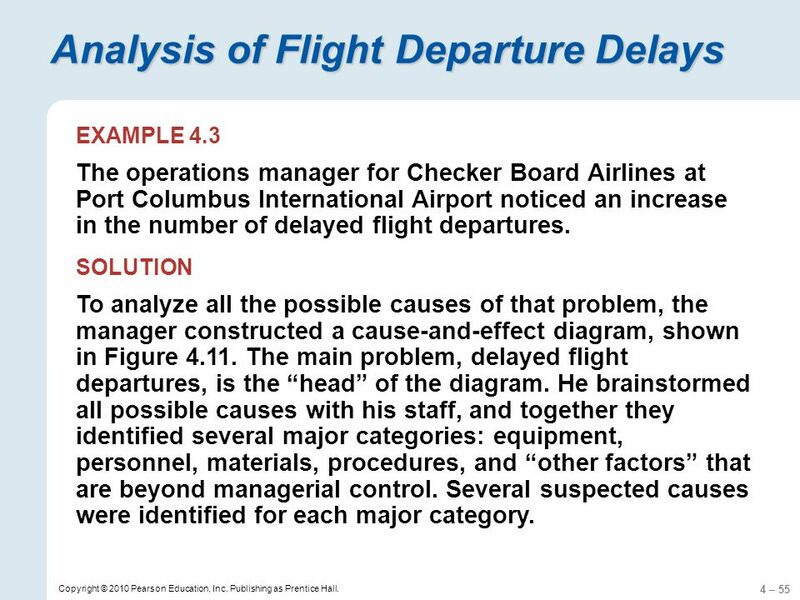 Analysis of Flight Departure Delays EXAMPLE 4.3 The operations manager for Checker Board Airlines at Port Columbus International Airport noticed an increase in the number of delayed flight departures. 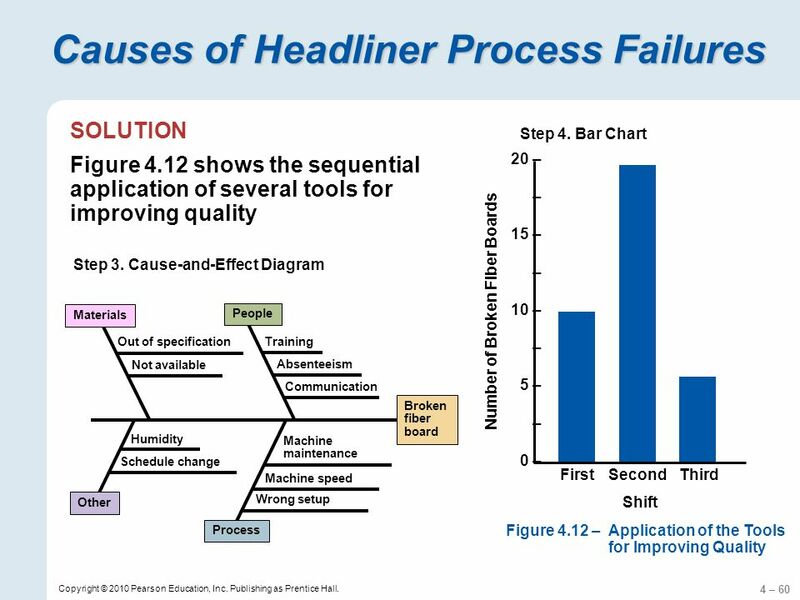 SOLUTION To analyze all the possible causes of that problem, the manager constructed a cause-and-effect diagram, shown in Figure 4.11. 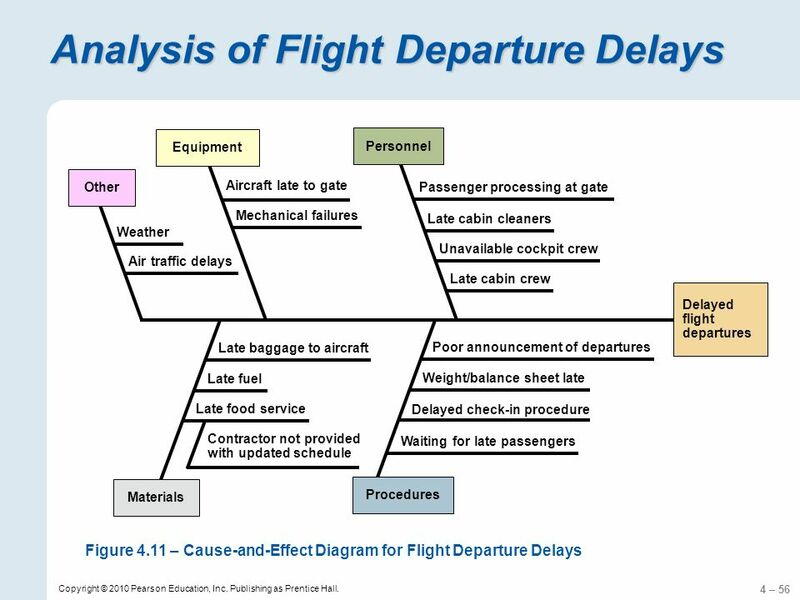 The main problem, delayed flight departures, is the head of the diagram. 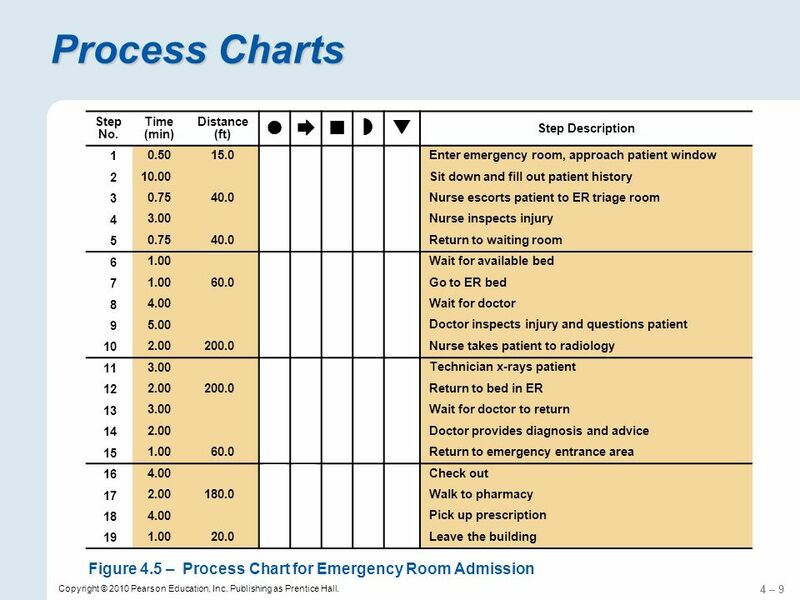 He brainstormed all possible causes with his staff, and together they identified several major categories: equipment, personnel, materials, procedures, and other factors that are beyond managerial control. Several suspected causes were identified for each major category. 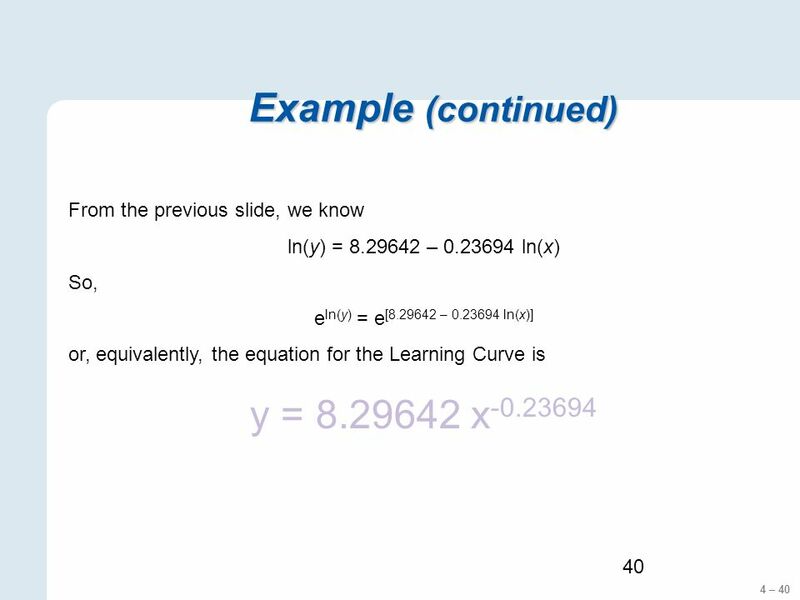 58 4 – 58 Copyright © 2010 Pearson Education, Inc. Publishing as Prentice Hall. 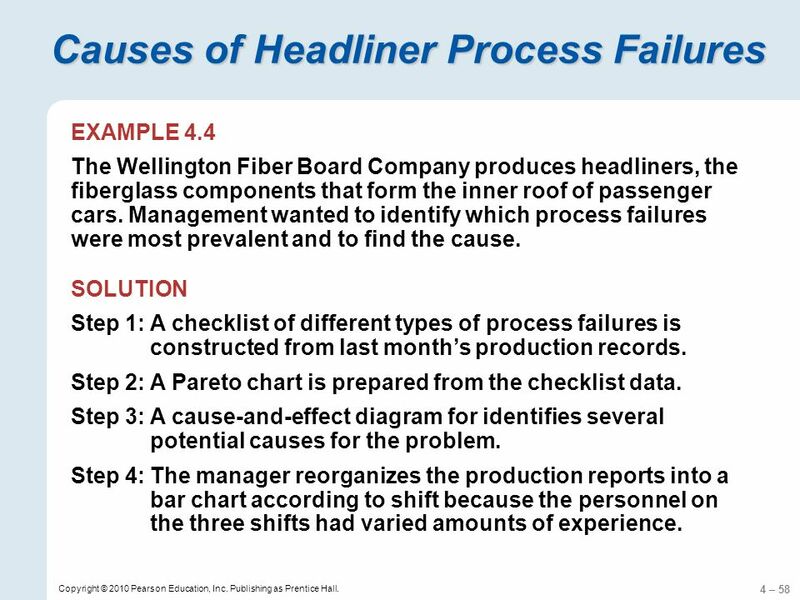 Causes of Headliner Process Failures EXAMPLE 4.4 The Wellington Fiber Board Company produces headliners, the fiberglass components that form the inner roof of passenger cars. 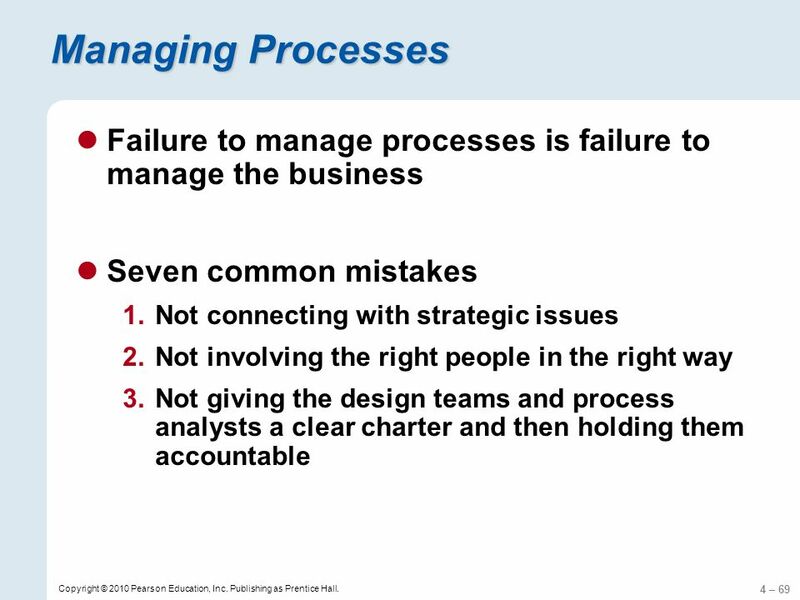 Management wanted to identify which process failures were most prevalent and to find the cause. 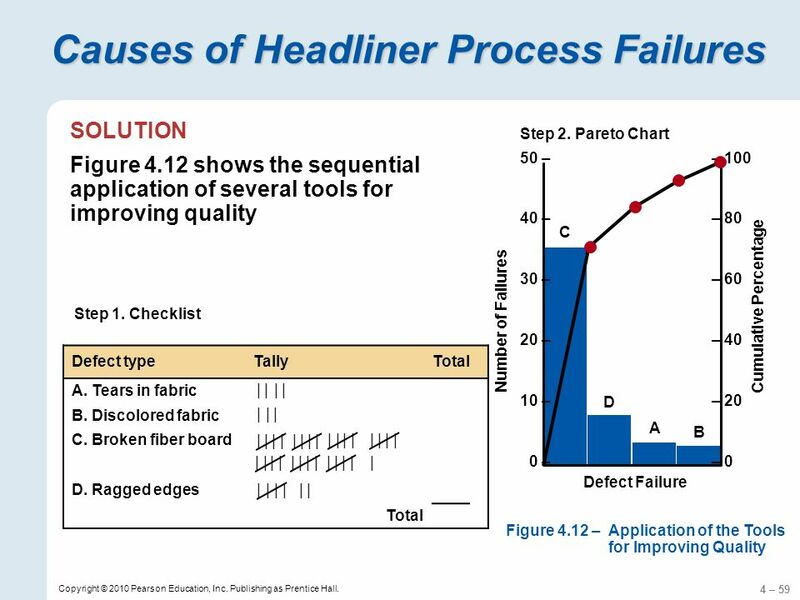 SOLUTION Step 1:A checklist of different types of process failures is constructed from last months production records. 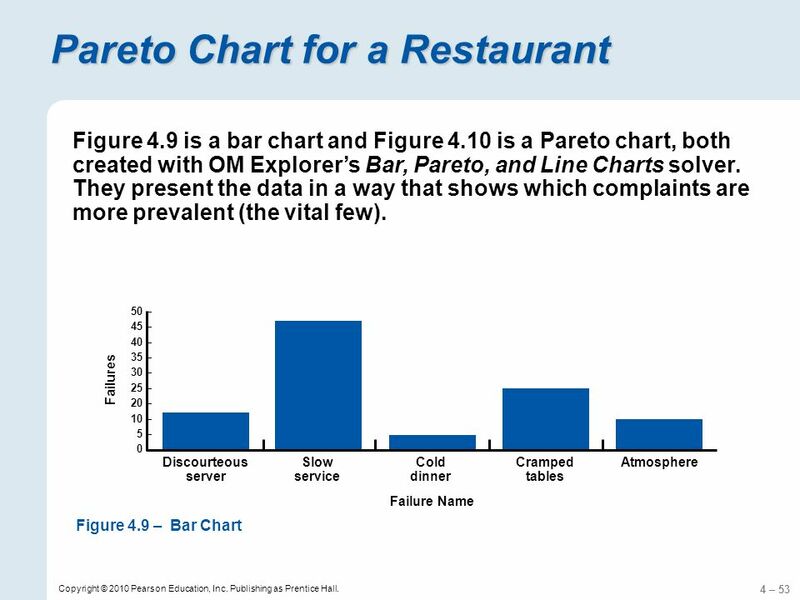 Step 2:A Pareto chart is prepared from the checklist data. 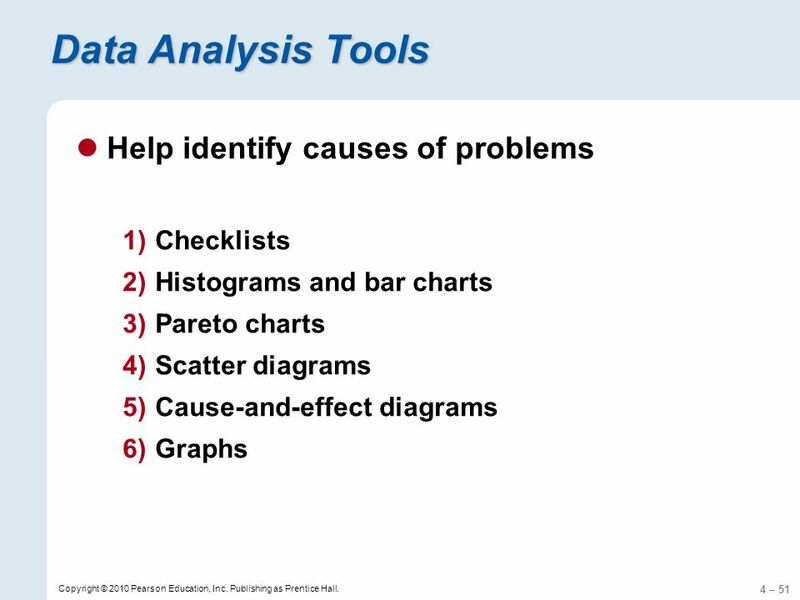 Step 3:A cause-and-effect diagram for identifies several potential causes for the problem. 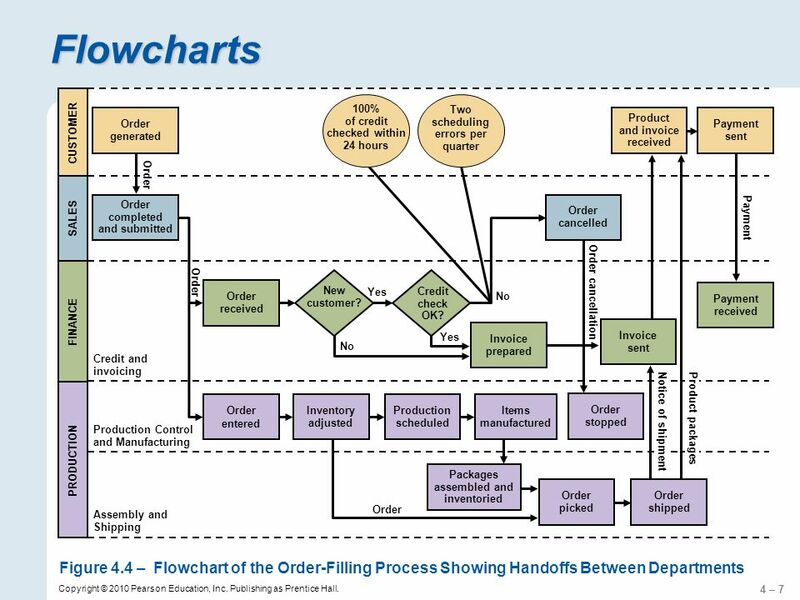 Step 4:The manager reorganizes the production reports into a bar chart according to shift because the personnel on the three shifts had varied amounts of experience. 62 4 – 62 Copyright © 2010 Pearson Education, Inc. Publishing as Prentice Hall. 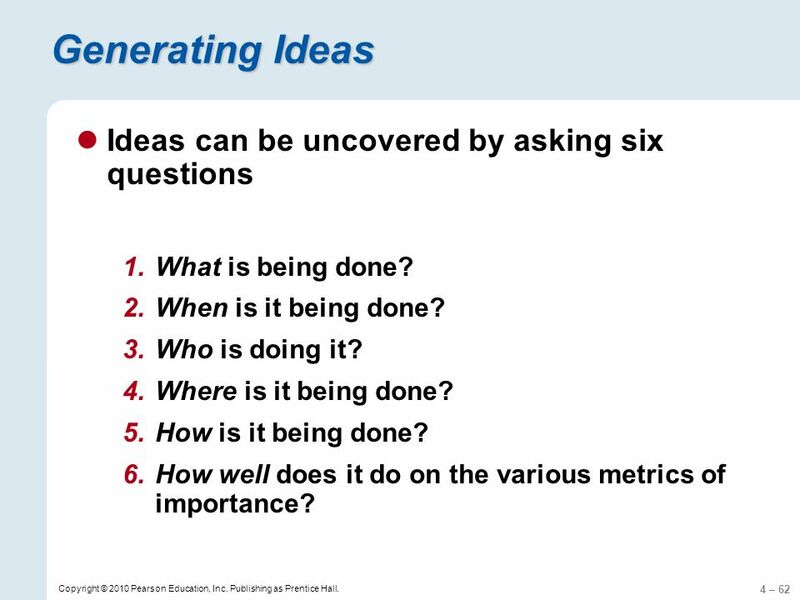 Generating Ideas Ideas can be uncovered by asking six questions 1.What is being done? 2.When is it being done? 3.Who is doing it? 4.Where is it being done? 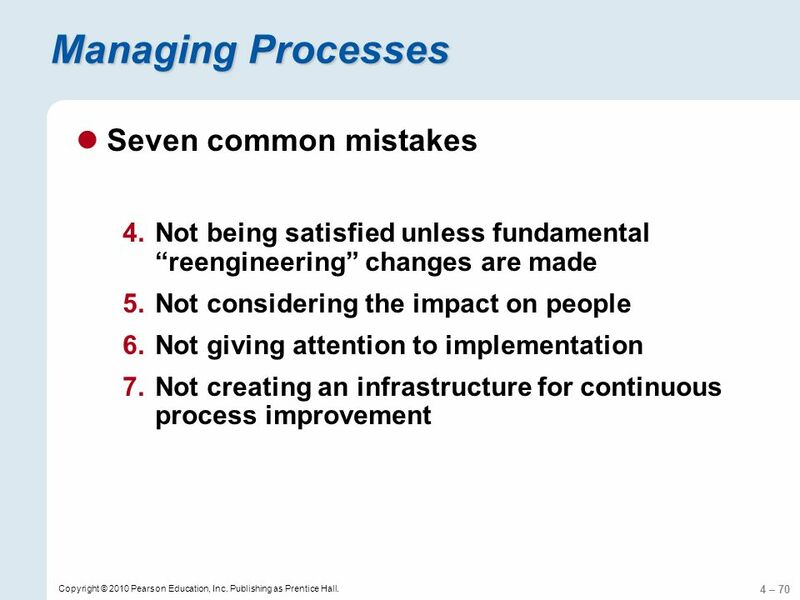 5.How is it being done? 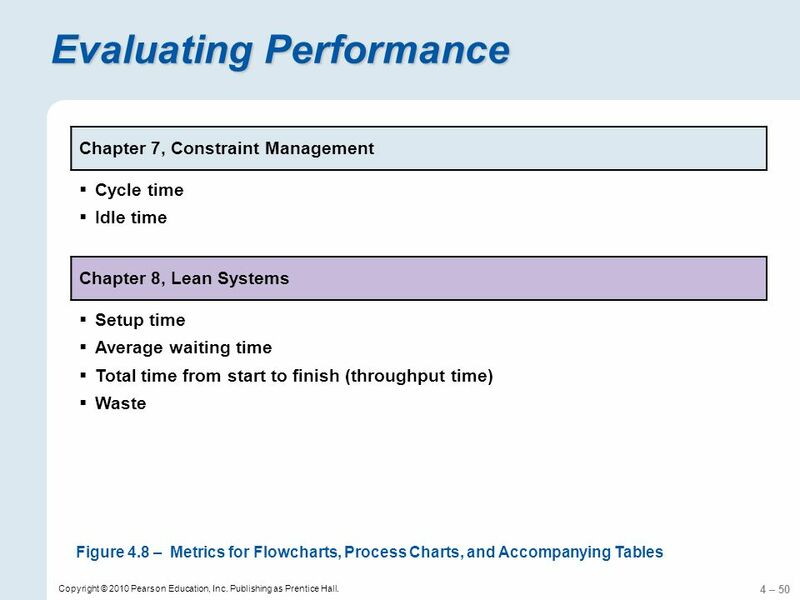 6.How well does it do on the various metrics of importance? 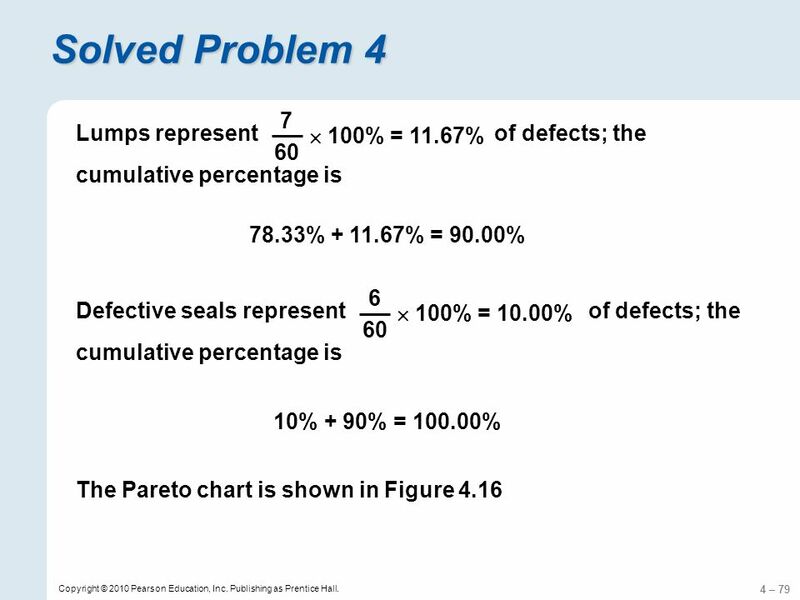 71 4 – 71 Copyright © 2010 Pearson Education, Inc. Publishing as Prentice Hall. 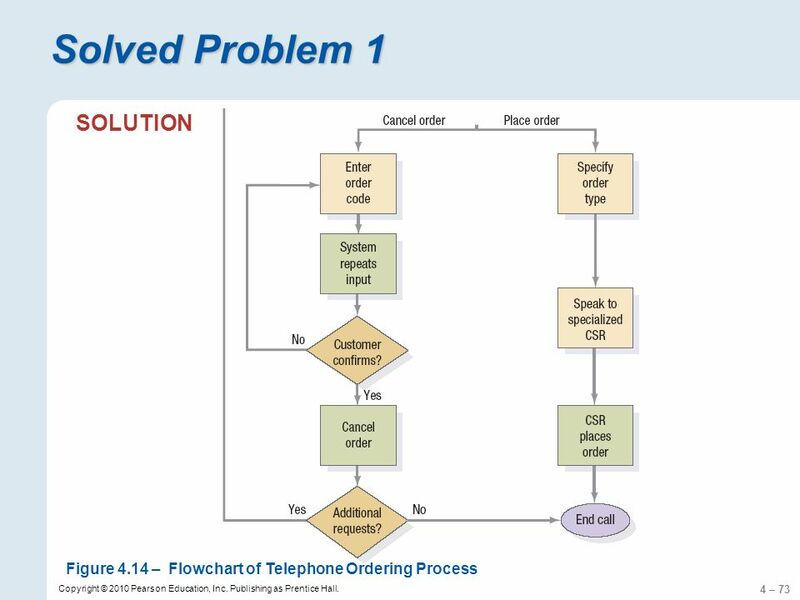 Solved Problem 1 Create a flowchart for the following telephone-ordering process at a retail chain that specializes in selling books and music CDs. 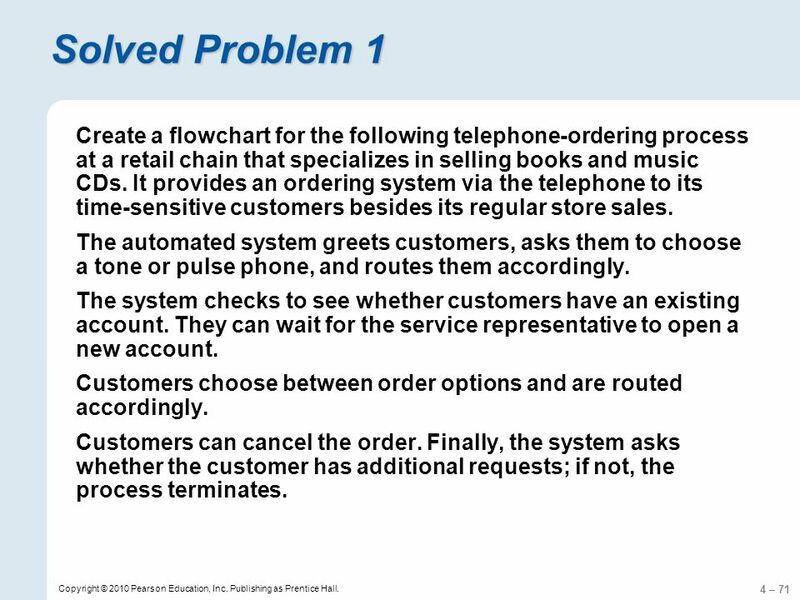 It provides an ordering system via the telephone to its time-sensitive customers besides its regular store sales. The automated system greets customers, asks them to choose a tone or pulse phone, and routes them accordingly. The system checks to see whether customers have an existing account. They can wait for the service representative to open a new account. Customers choose between order options and are routed accordingly. Customers can cancel the order. 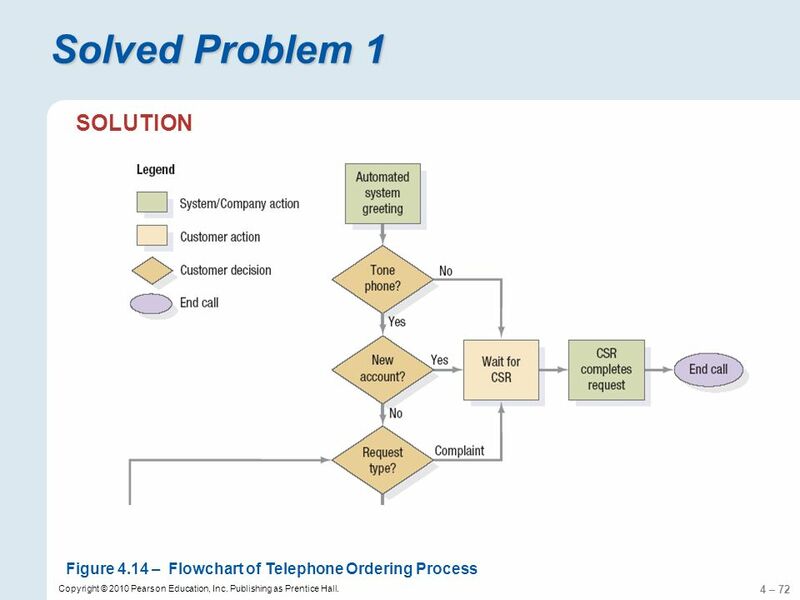 Finally, the system asks whether the customer has additional requests; if not, the process terminates. 74 4 – 74 Copyright © 2010 Pearson Education, Inc. Publishing as Prentice Hall. 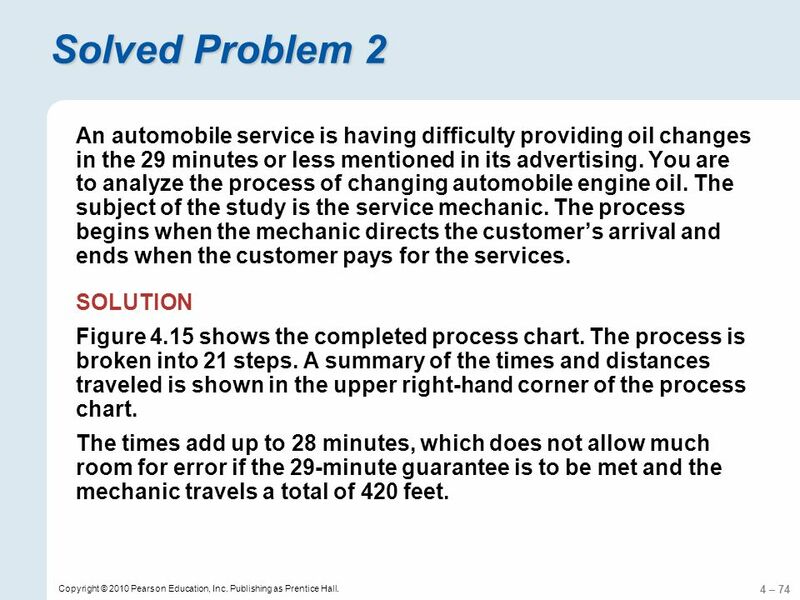 Solved Problem 2 An automobile service is having difficulty providing oil changes in the 29 minutes or less mentioned in its advertising. 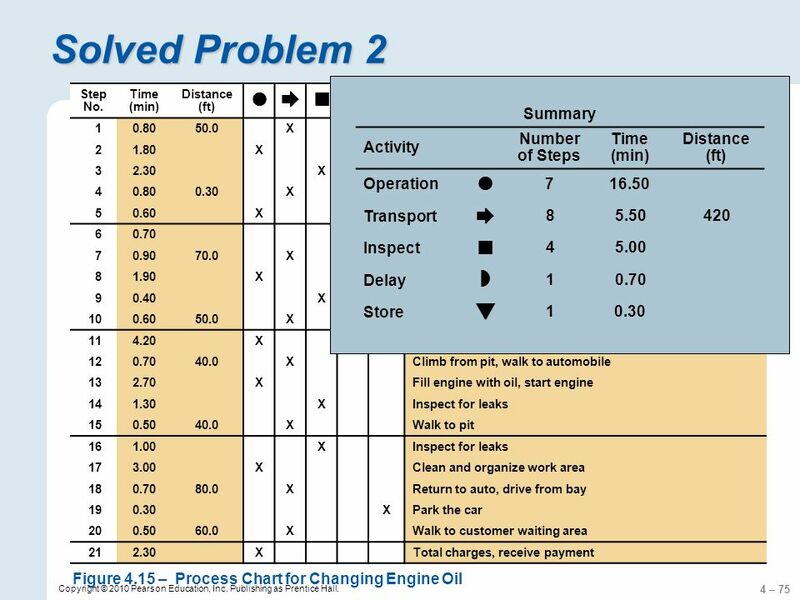 You are to analyze the process of changing automobile engine oil. The subject of the study is the service mechanic. The process begins when the mechanic directs the customers arrival and ends when the customer pays for the services. 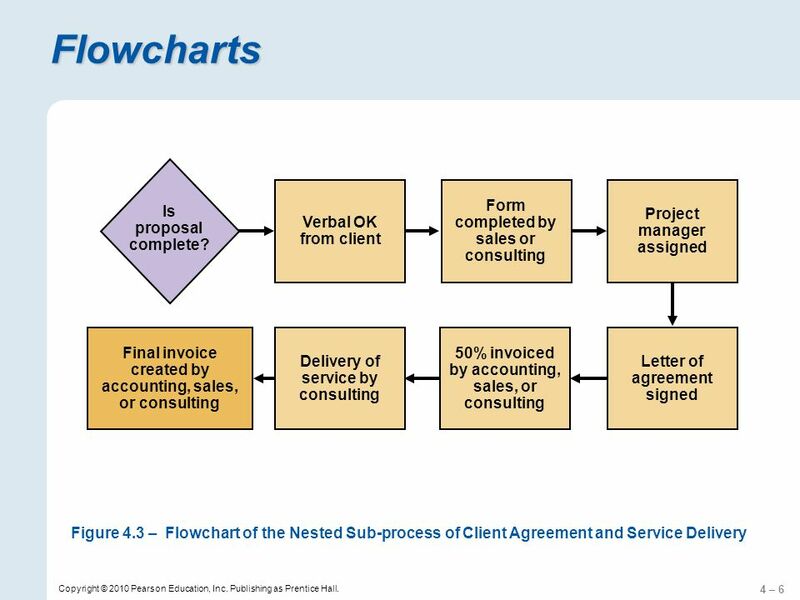 SOLUTION Figure 4.15 shows the completed process chart. 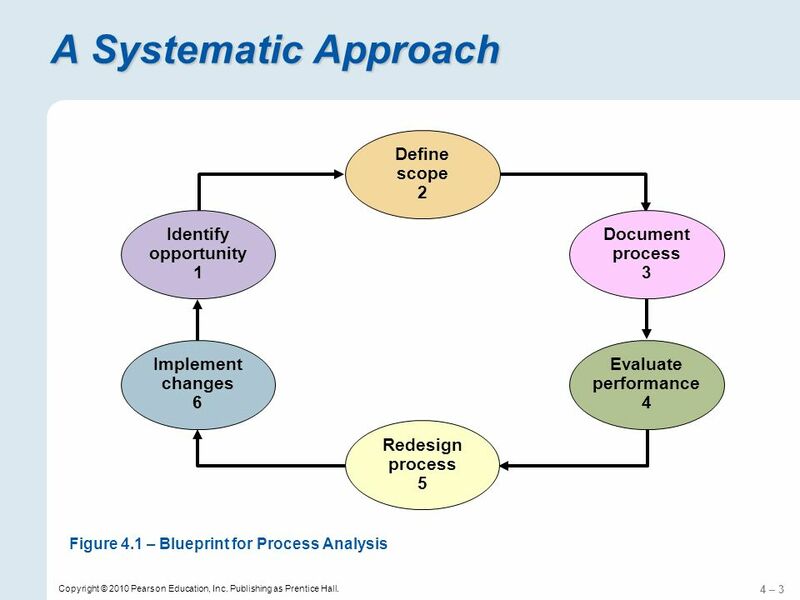 The process is broken into 21 steps. 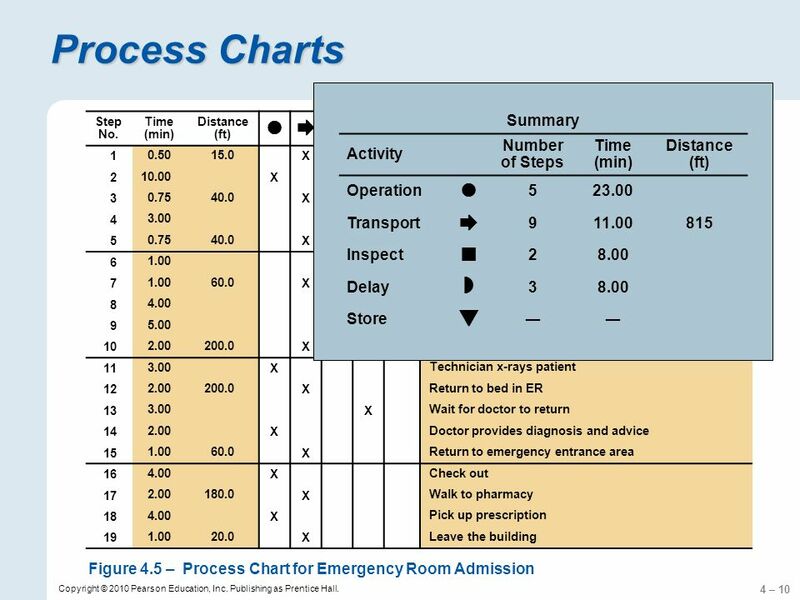 A summary of the times and distances traveled is shown in the upper right-hand corner of the process chart. The times add up to 28 minutes, which does not allow much room for error if the 29-minute guarantee is to be met and the mechanic travels a total of 420 feet. 76 4 – 76 Copyright © 2010 Pearson Education, Inc. Publishing as Prentice Hall. 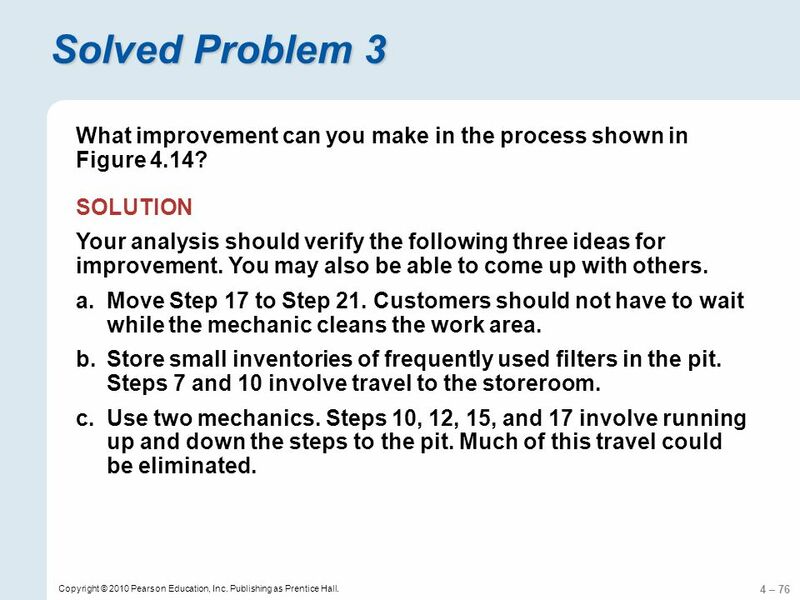 Solved Problem 3 What improvement can you make in the process shown in Figure 4.14? 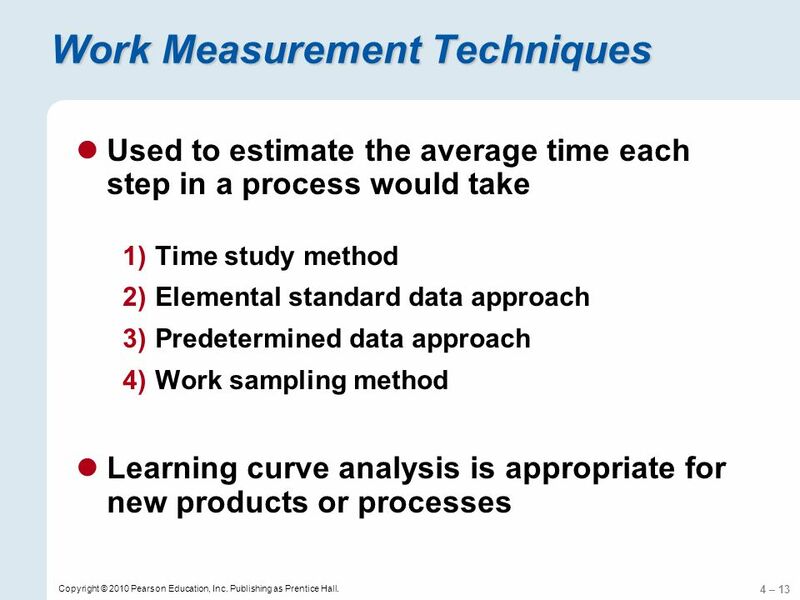 SOLUTION Your analysis should verify the following three ideas for improvement. 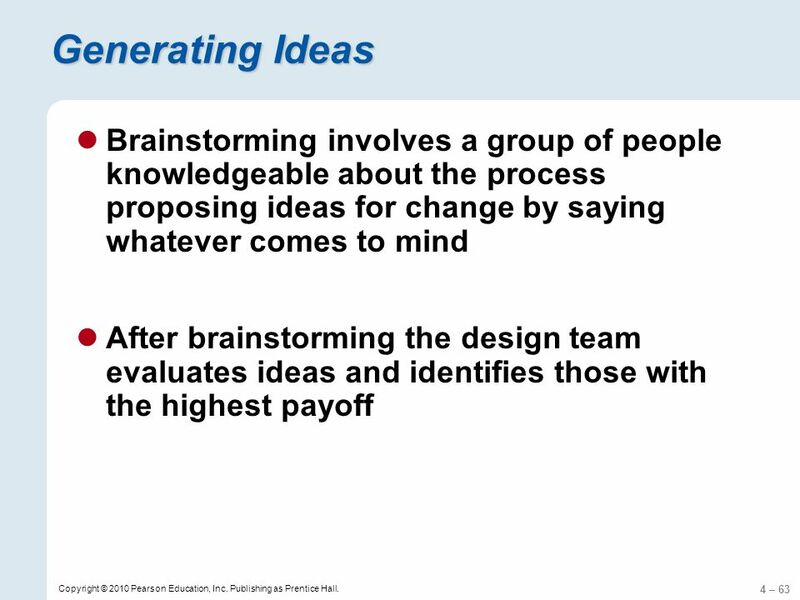 You may also be able to come up with others. a.Move Step 17 to Step 21. Customers should not have to wait while the mechanic cleans the work area. b.Store small inventories of frequently used filters in the pit. Steps 7 and 10 involve travel to the storeroom. c.Use two mechanics. Steps 10, 12, 15, and 17 involve running up and down the steps to the pit. Much of this travel could be eliminated. 77 4 – 77 Copyright © 2010 Pearson Education, Inc. Publishing as Prentice Hall. 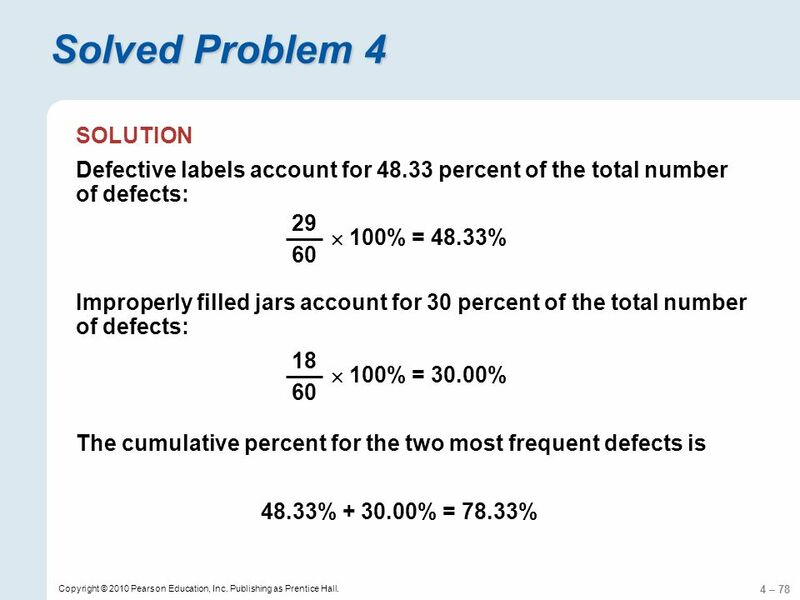 Solved Problem 4 DefectFrequency Lumps of unmixed product7 Over- or underfilled jars18 Jar lids did not seal6 Labels rumpled or missing29 Total60 Vera Johnson and Merris Williams manufacture vanishing cream. 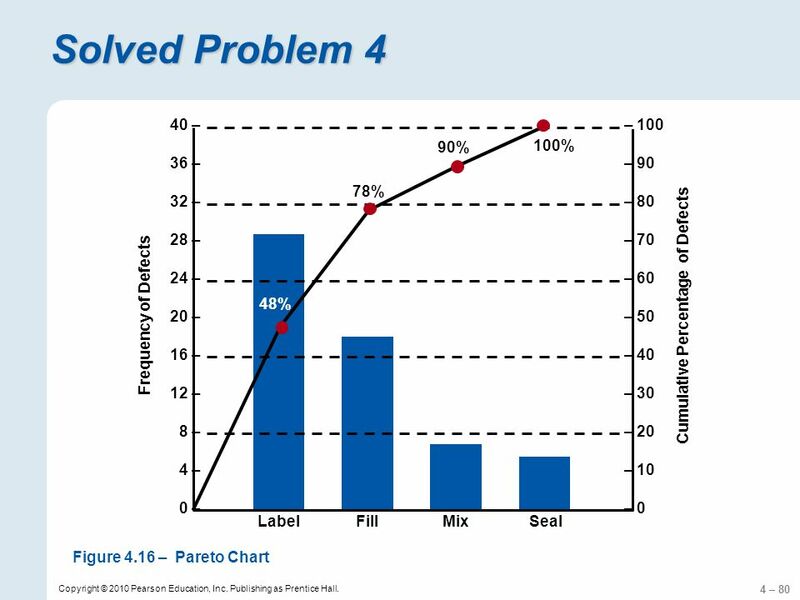 Their packaging process has four steps: (1) mix, (2) fill, (3) cap, and (4) label. 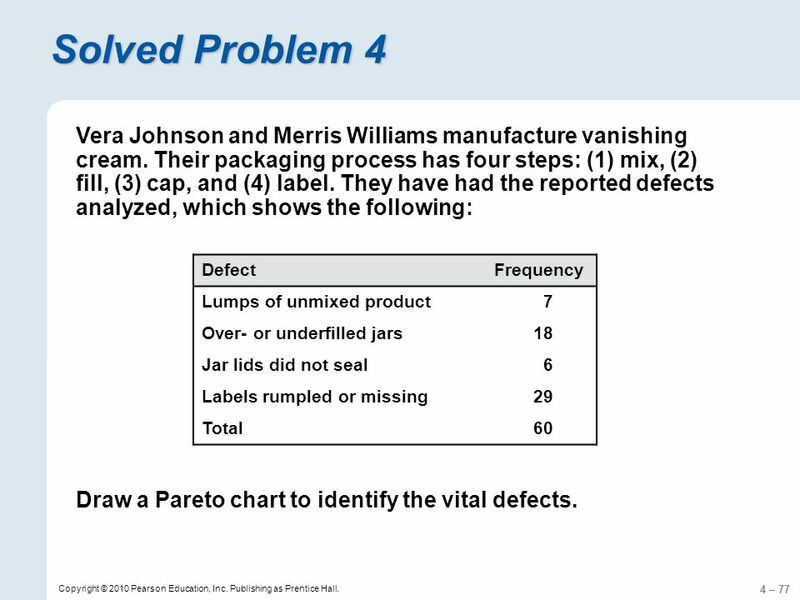 They have had the reported defects analyzed, which shows the following: Draw a Pareto chart to identify the vital defects. 81 4 – 81 Copyright © 2010 Pearson Education, Inc. Publishing as Prentice Hall. 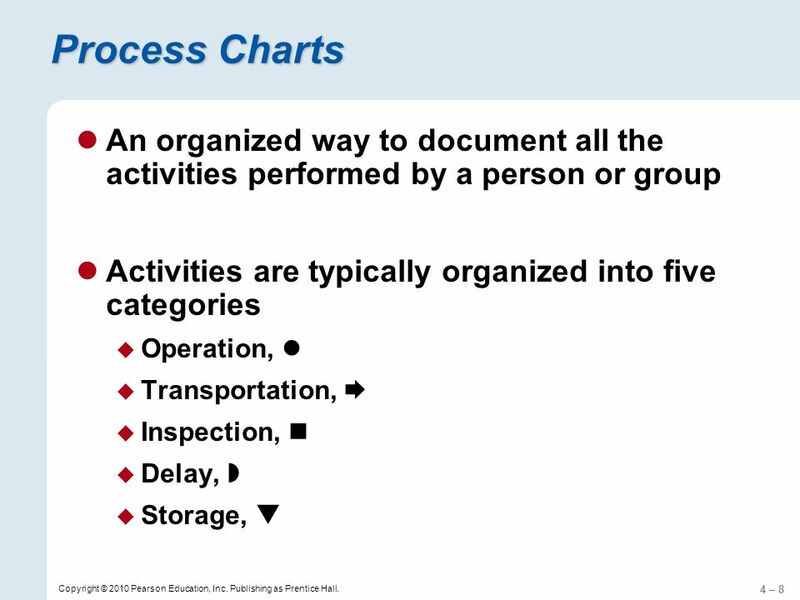 Download ppt "4 – 1 Copyright © 2010 Pearson Education, Inc. Publishing as Prentice Hall. 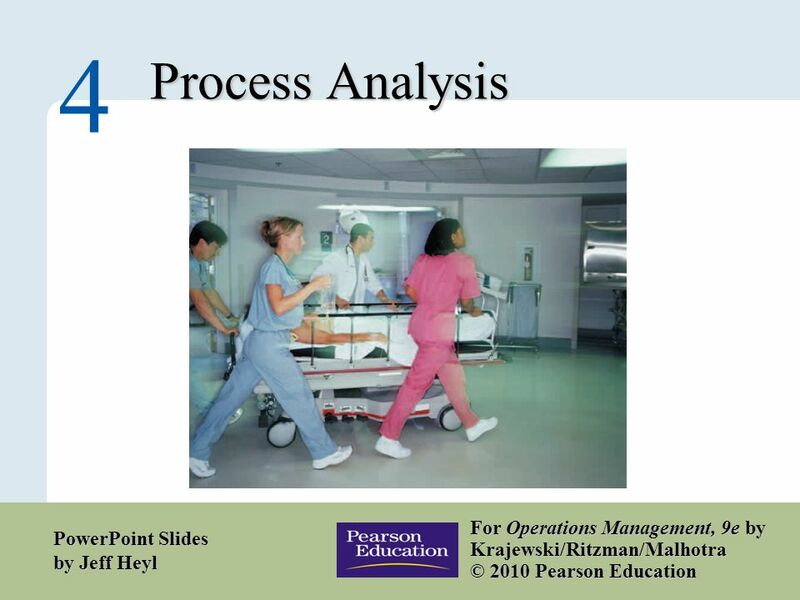 Process Analysis 4 For Operations Management, 9e by Krajewski/Ritzman/Malhotra." 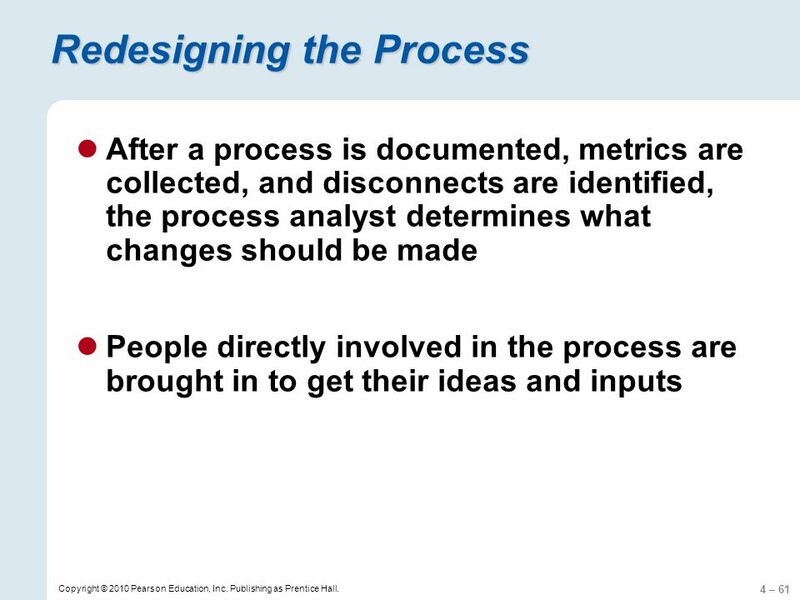 © 2007 Pearson Education Process Analysis Chapter 5.